The sacred month of Muharram is the first month of the Islamic calendar that holds great historical significance even prior to the proclamation of Prophet Muhammad (saw) message. While many celebrate the coming of the new year, the Muslims to the contrary attend what is known as Majalis or 'a place of sitting' wherein eulogies are recited. 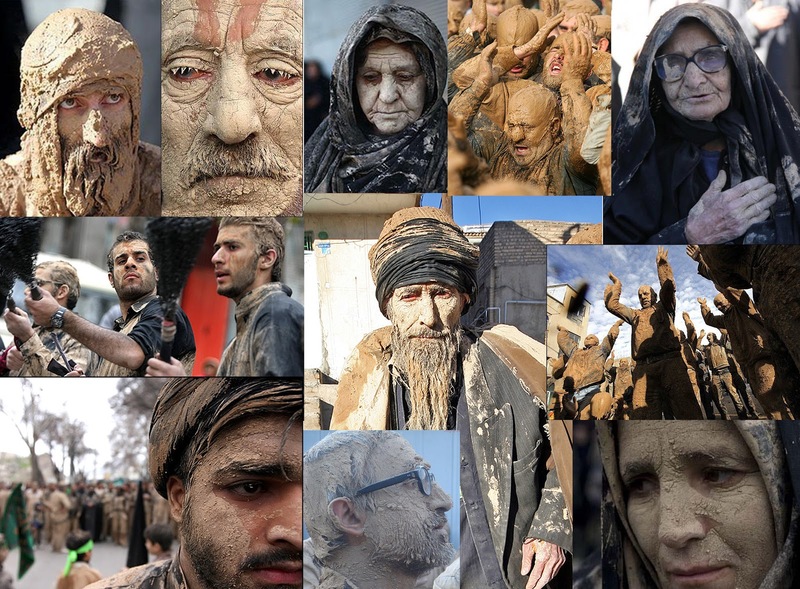 People carry out various forms of mourning as an expression of grief upon remembrance of the tragedy of Karbala. Imam Hussain (a.s), his family members (a.s), and his close friends (r.a) had been mercilessly killed by the army of Yazid (la) who was a despotic ruler of the Muslim world. 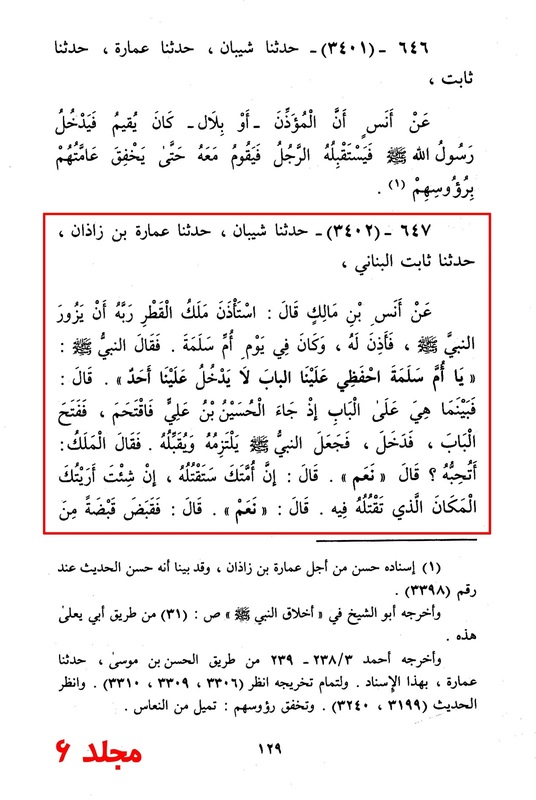 He came to power after the death of his father, Mu’awiyah ibn Aboo Sufyan (la). Imam Hussain (a.s) was the youngest from the two beloved grandsons of the Prophet Muhammad (saw), the sons of Bibi Faatima (s.a), the daughter of the Holy Prophet (saw). The Holy Prophet loved his two grandsons, Imam Hassan (a.s) and Imam Hussain (a.s) immensely since there were no surviving sons of his own. 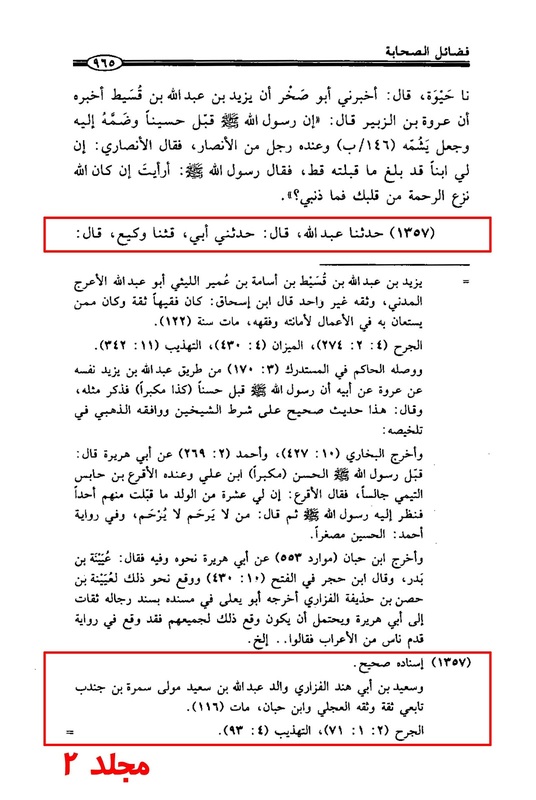 He (saw) used to call them his “sons” out of affection. There are numerous traditions recorded by the opponents which indicate the status of both of his grandsons (peace be upon them) and the significance of this momentous occasion of Ashura. (It is narrated through Abu Huraira, Abu Qotada and Jabir ibn Abdullah Ansari who all said): The Messenger of Allah (saw) said: "Whoever sees me in a dream has in fact seen me, for Satan is not able to appear in my form." Source: Saheeh Muslim. Vol. 2, Pg. # 1076-1077. 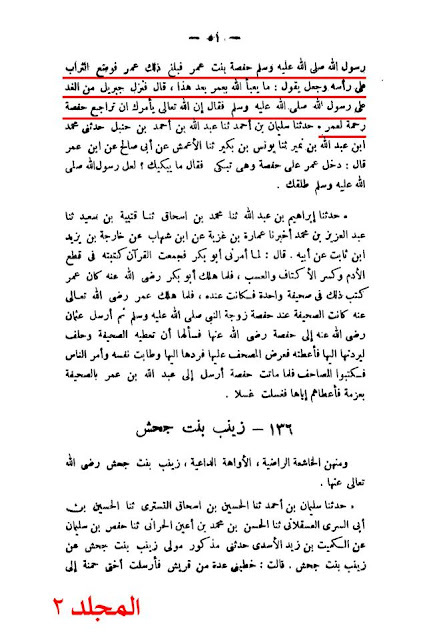 The Prophet (saw) did not give any orders to carry out these Hussaini practices and dreams cannot be used as evidence. 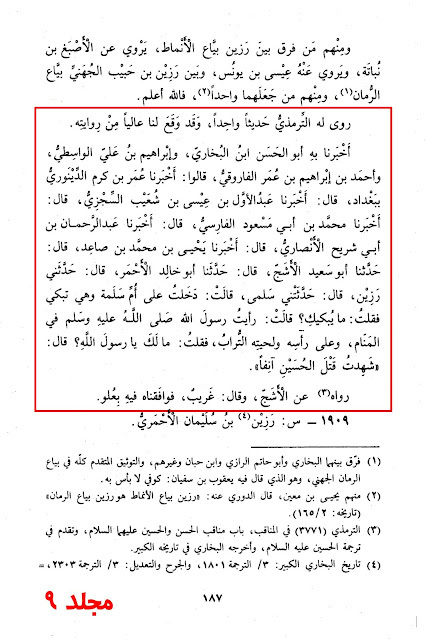 Shi'a scholars themselves are in agreement with this, for instance the grand scholar Al-Khoei. Question 1314: If a believer saw the Prophet (pbuh) in a dream or one of the Imams (as) and that they ordered something, would it be obligatory to follow, since it is said that the Shaytan does not appear in their form? Al-Khoei: Orders in dreams are not considered proof. 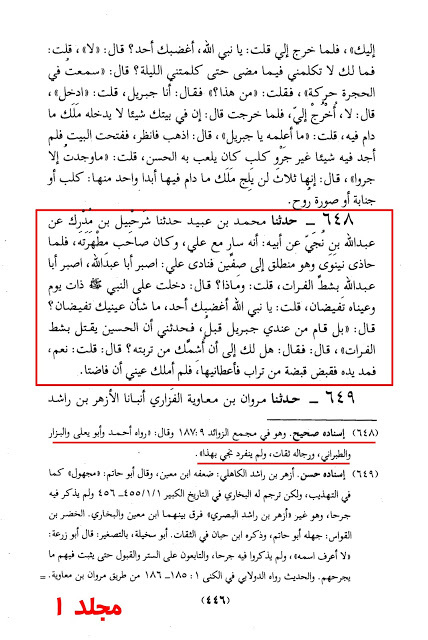 Those who bring up such an absurd objection clearly lack the understanding to comprehend the distinction between the Prophet's (a.s) dream and a regular believer. 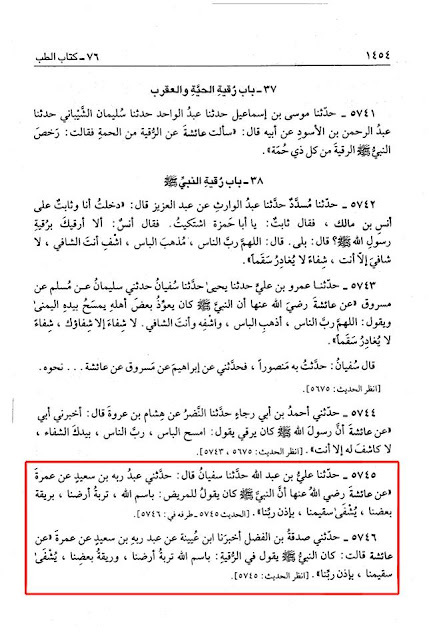 If a person saw the Prophet (saw) in his dream, he most certainly did see him. This is supported by authentic hadeeth as mentioned at the beginning of the article. 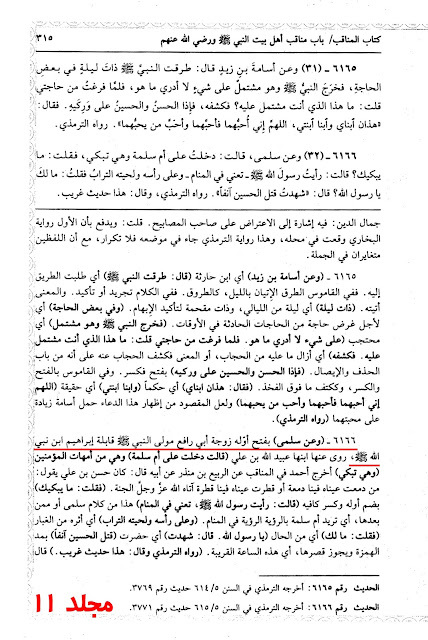 It has been verified that Iblees has not been empowered to change himself in form of Prophet Muhammad (saw) in a dream. 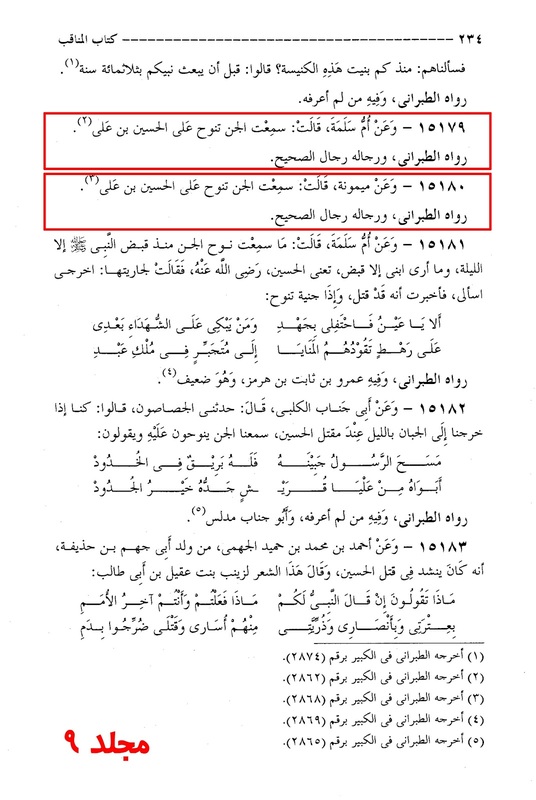 Now if an individual has been given orders and guidance in the dream which is in accordance to the laws of Shari'ah, then it will be a source of evidence for only himself and not for others. 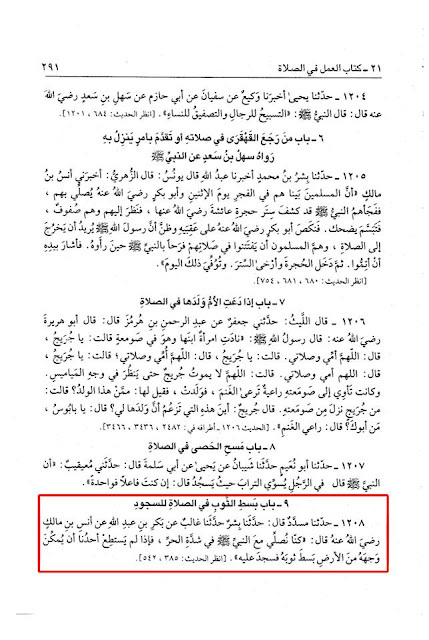 However, if the guidance is contrary to the laws of Shari'ah, then it cannot be accepted nor will it be a source of evidence for anyone. The reason for this is that not every person is privileged enough to understand dreams and their interpretations. 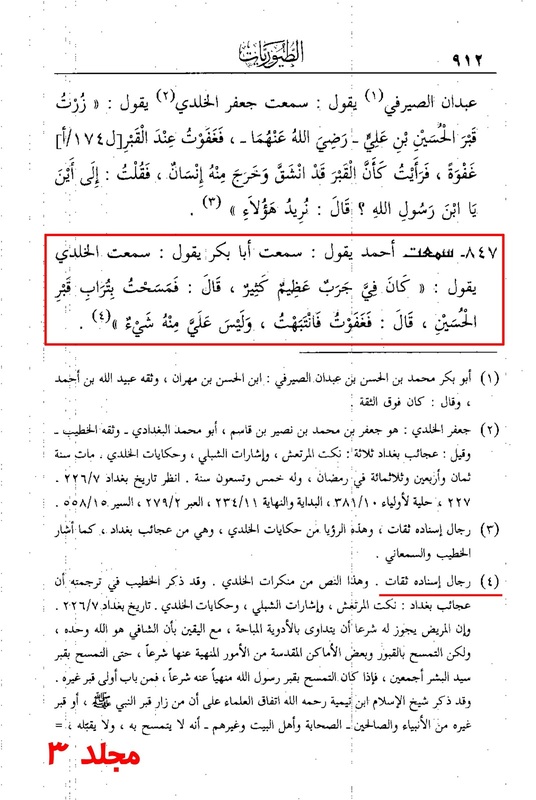 Consider a person being ordered to consume alcohol by the Prophet (saw). 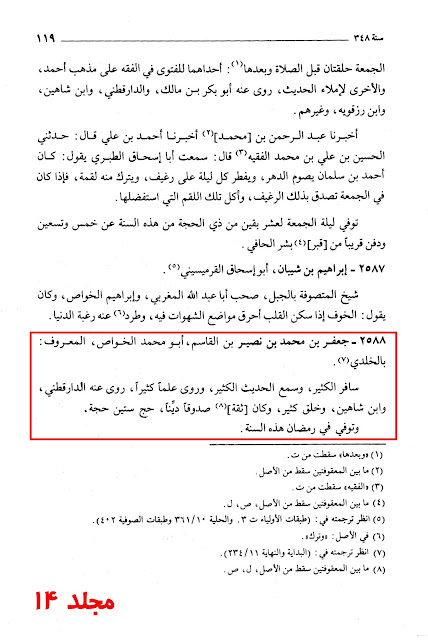 We know according to Shari'ah that it is unlawful. However, due to his misunderstanding and the disorder of the mind, one might have understood something to the contrary and heard him (saw) saying, "Consume alcohol" rather than "Don't consume alcohol." The fatwa of Al-Khoei and other scholars cannot be applied here since the narrations do not contain any order and likewise neither is covering one self in dust a sin since there is nothing explicitly forbidding it in Qur'aan and Hadeeth. 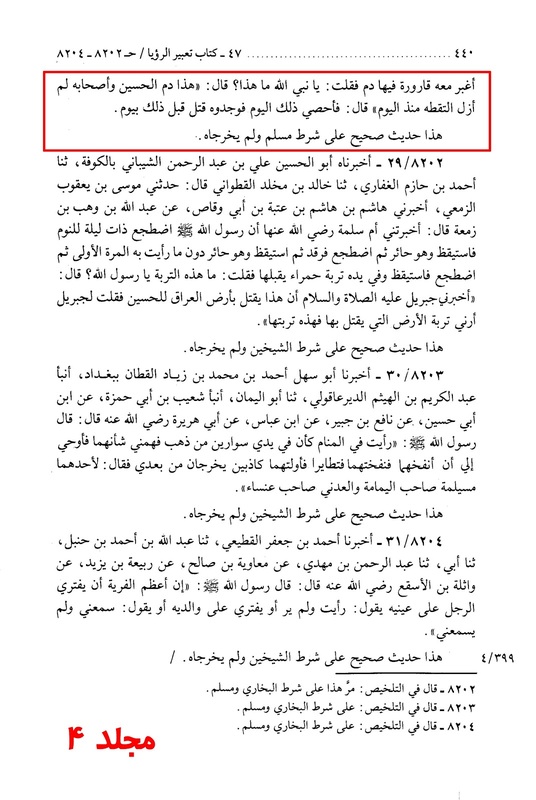 The practice of Hussaini rituals is merely out of love for the Prophet (saw). The Shi'a cover themselves with dust as a mark of distress just as the Prophet (saw) was seen in the dream as being disheveled and covered with dust. 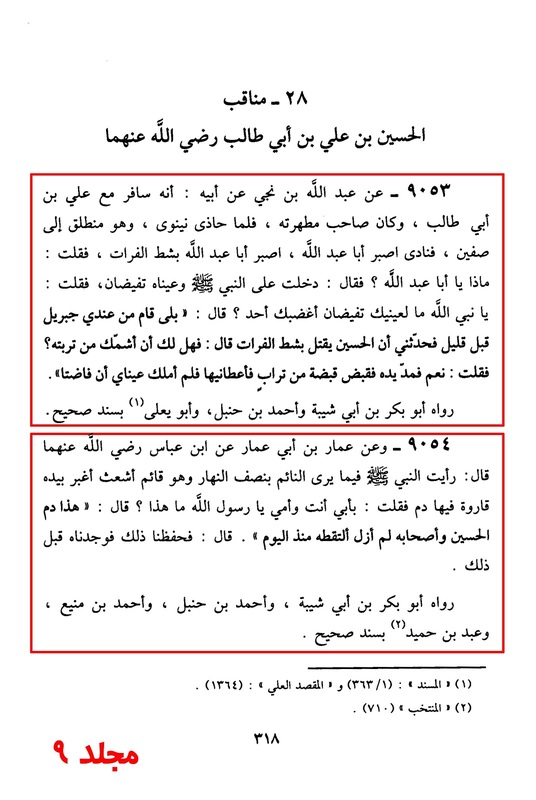 Once again, we see the so-called 'Ahl us Sunnah' having a problem with this in which case, they should also have the same problem with Umar ibn Al-Khattab, who also covered himself with dust at the thought of Prophet (saw) divorcing his daughter Hafsa for her bad behaviour towards the Prophet (saw). One of the major acts done in reverence of Hajre Aswad is its kissing. Muslims in the form of kissing it exhibit the love and reverence for the stone. Moreover, besides the expression of love, this reverence is also a Sunnah of Prophet Muhammad (saw). 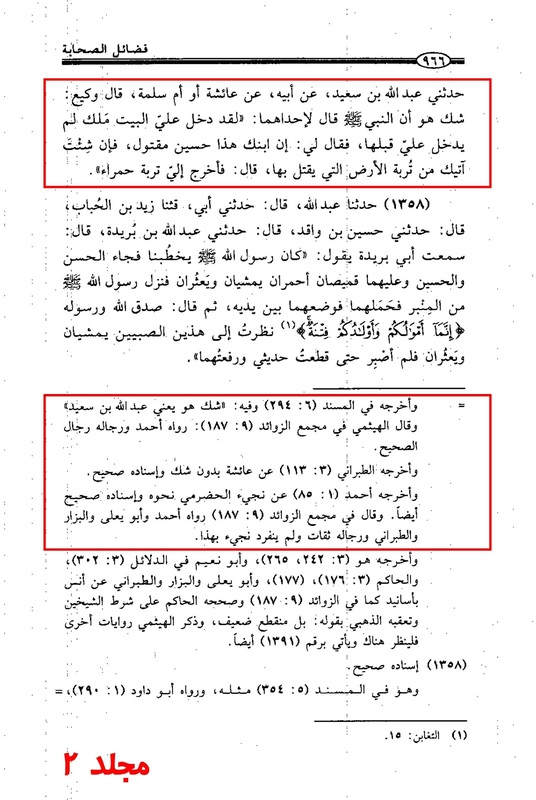 Prophet Muhammad (saw) kissed Hajre Aswad during the Tawaf He did during Pilgrimage. Therefore, since then it has become a necessary element of Tawaf and Muslims kiss the stone after every single circumambulation of the Kaaba. Hence, in no way the kissing of Hajre Aswad is paying respect to the stone, rather it is done just in the remembrance of Prophet Muhammad (saw). Although the Muslims kissing the stone understand and know about the reason behind their kissing of it, however, people who are non-believers or those who have lack of knowledge about Islam have some misconceptions pertaining to the kissing of black stone. If someone loves something dearly and therefore has the desire to kiss it, it cannot be labelled as an innovation and associating partners unto Allah (swt). If kissing an object is 'Shirk,' then what would we call kissing Hajar Al-Aswad (the black stone)? Narrated `Abis bin Rabi`a: `Umar came near the Black Stone and kissed it and said "No doubt, I know that you are a stone and can neither benefit anyone nor harm anyone. Had I not seen Allah's Messenger (saw) kissing you I would not have kissed you." 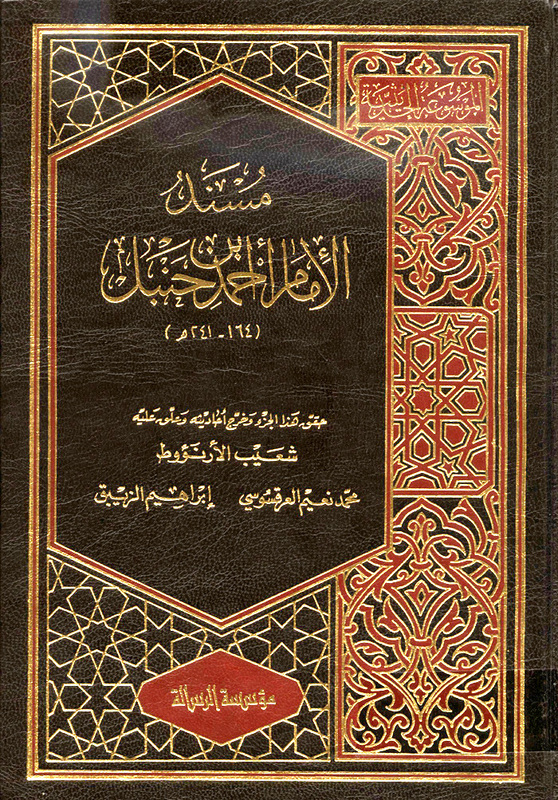 Source: Saheeh Al-Bukhari. H. # 1597. Pg. # 388. Suwaid b. Ghafala reported: I saw Umar kissing the Stone and clinging to it and saying: "I saw Allah's Messenger (saw) having great love for you." Source: Saheeh Muslim. H. # 1271/252. Pg. # 578. 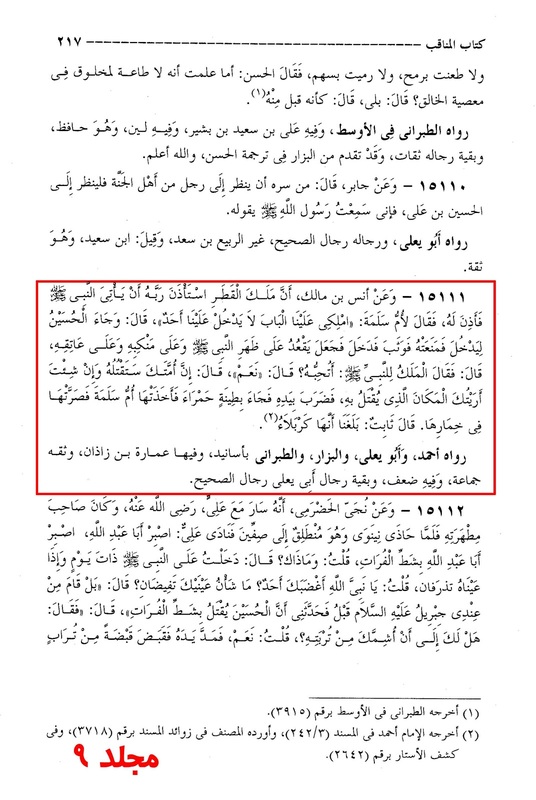 Ibn Kathir: It's chain is strong. 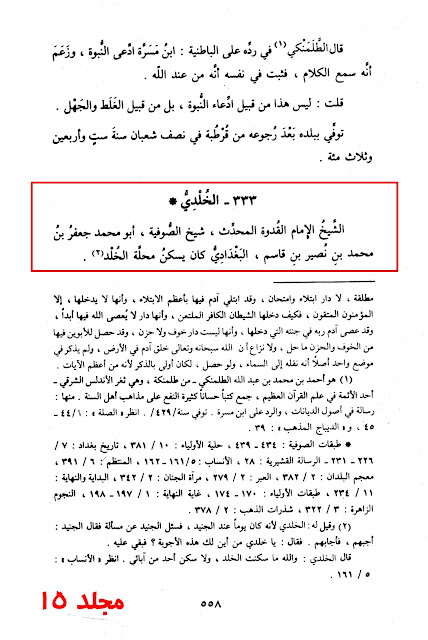 Footnote: It's chain is (rather) Saheeh (Authentic). 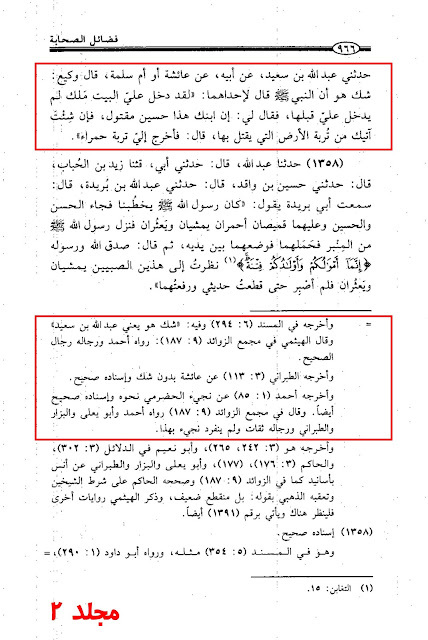 Source: Al-Bidayah Wa'an-Nihayah. Vol. 11, Pg. # 573 - 571. 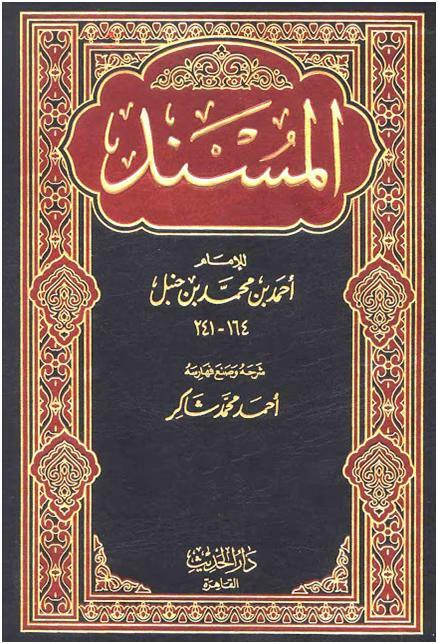 Footnote: Narration is Authentic by the condition of Imam Muslim and Al-Tabarani has reported it in his Hadeeth # 2822 and 12837. And Hakim Al-Nishaburi in his Al-Mustadrak Alaa Al-Sahihain. Vol. 4. 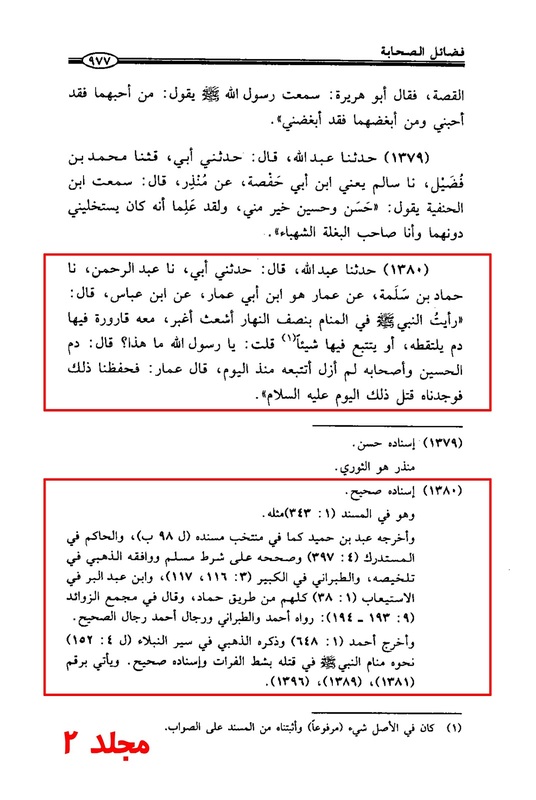 Page # 397, with chains from Hammad ibn Salamah and Al-Hakim has authenticated the chain under the conditions of Muslim and Al-Dhahabi has accepted them. 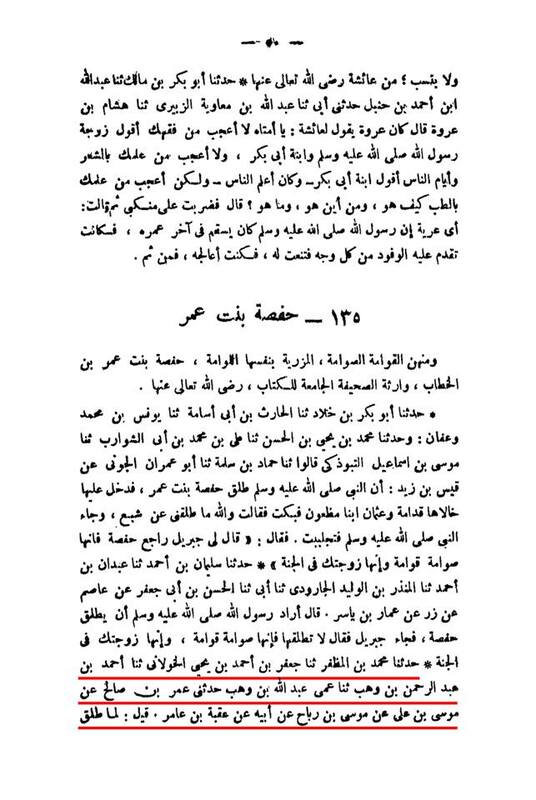 Source: Musnad Ahmad ibn Hanbal. Vol. 4, H. # 2165, Pg. # 59 - 60. This narration has multiple chains and we also find that the same narration has been recorded in Ahmad ibn Hanbals book, 'Virtues of the Companions.' 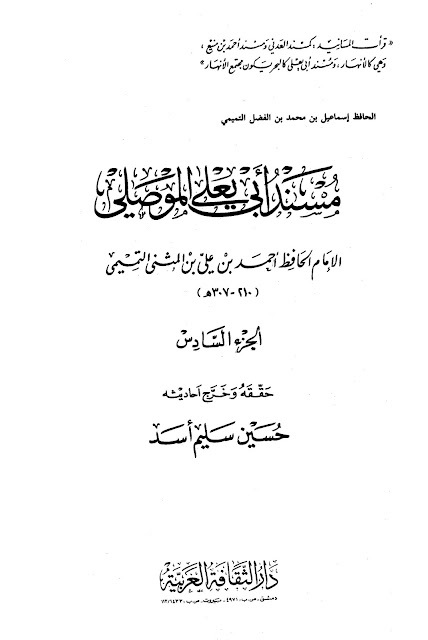 The footnote to this narration has been graded Saheeh (Authentic) whereupon the verifier of this book, Wasi Allah Muhammad Abbas, points out a collection of this very Hadeeth with varying chains. 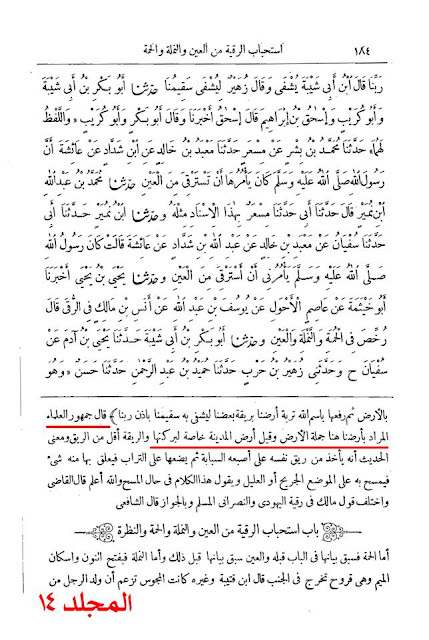 Source: Fada'il Al-Sahaba. Vol. 2, Pg. # 977. Ammar said that Ibn Abbas said: ‘One afternoon I dreamt of Holy Prophet (saw) standing with his hair disturbed and with dust tangled in them and he was holding a phial filled with blood. 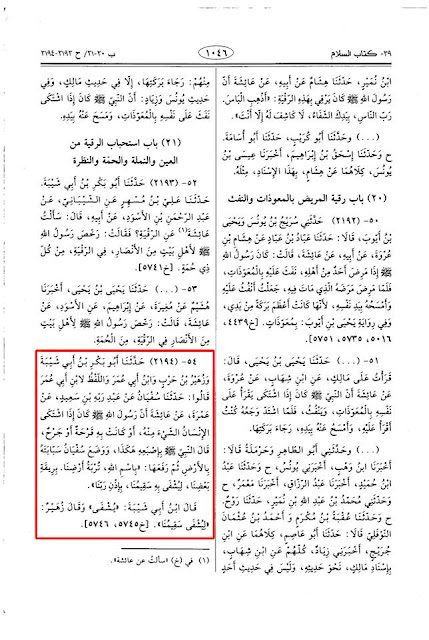 I said to the Prophet (saw): ‘O Allah’s Prophet, what are you holding?’ The Prophet (saw) replied: ‘This is the blood of Hussain and his companions that I have been collecting all the day long.” They did calculation and found out that he (Hussain) was killed a day before it (the day of dream). 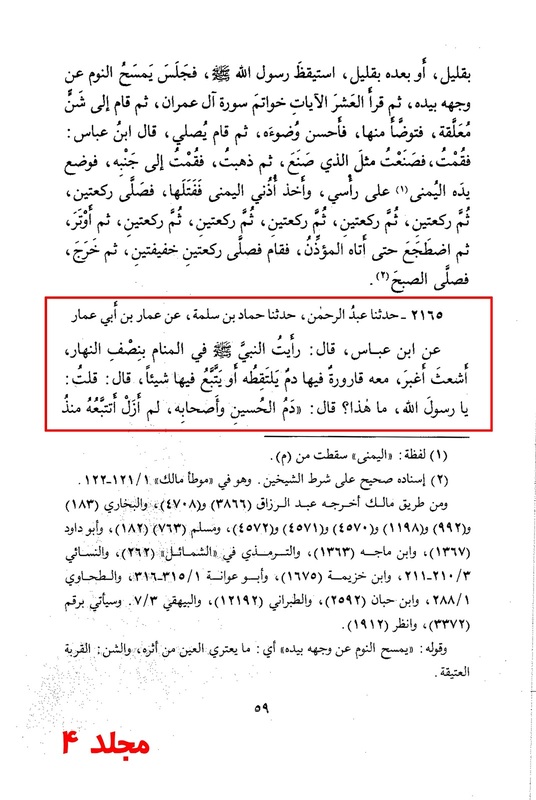 Al-Hakim: This narration is Saheeh (Authentic) by the criteria of Muslim, but they (i.e Bukhari and Muslim) have not narrated it. 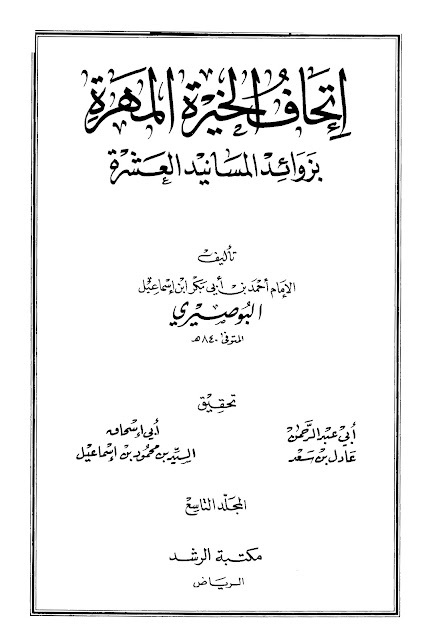 Source: Al-Mustadrak Ala Sahihayn. Vol. 4, Pg. # 439-440. Narrated from Ibn Abbas who said: "One afternoon I dreamt of Holy Prophet (saw) standing with his hair disturbed and with dust tangled in them and he was holding a phial filled with blood. I said to the Prophet: 'O Allah’s Prophet, What are you holding?' The Prophet (saw) replied: 'This is the blood of Hussain and his companions that I have been collecting all the day long.' 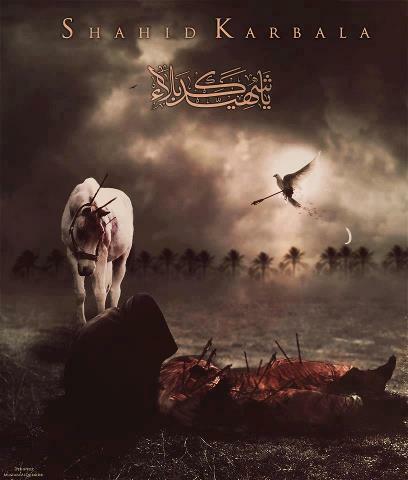 They did calculation and found out that he (Hussain) was killed a day before it (the day of dream)." 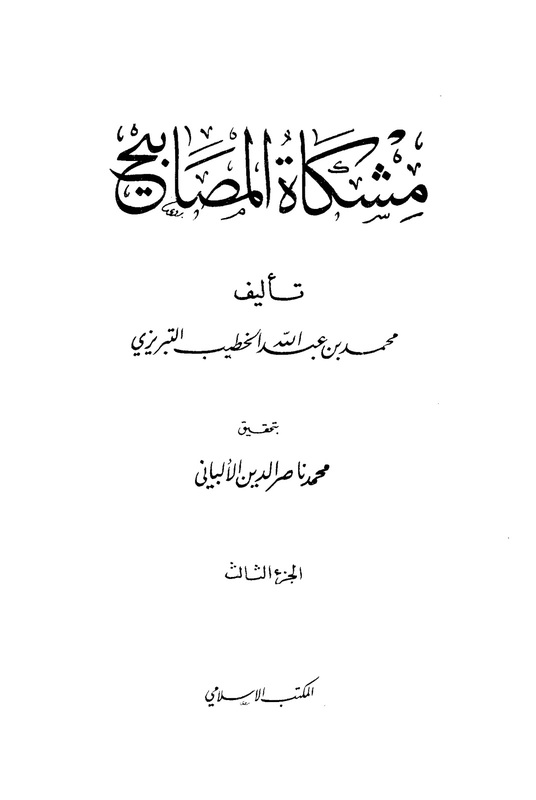 Al-Albani: It's chain is Saheeh (Authentic). 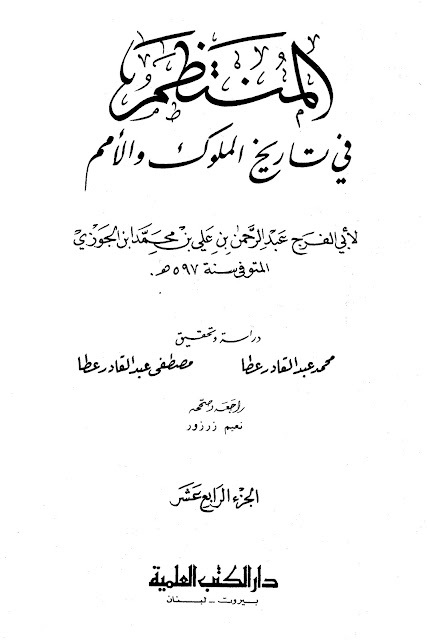 Source: Mishkatul Masabih of Al-Albani. Vol. 3, Pg. # 1741-1742. Narrated Aboo Khalid Al-Ahmar from Razeen from Salma who said: I went to Umm Al-Salamah and she was crying. So I asked what makes you cry? She said: "I saw the Messenger of Allah (saw) in a dream, and there was dust on his head and beard." I said: 'What is wrong O Messenger of Allah (saw)?' He said: "I just witnessed the martyrdom of Hussain (a.s)." 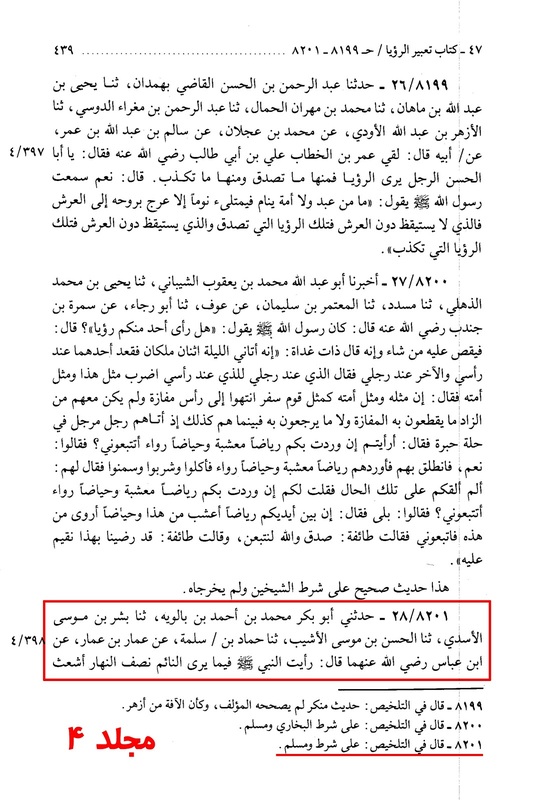 Al-Dhahabi: Razeen is ibn Habib and ibn Mo'een has Authenticated him. 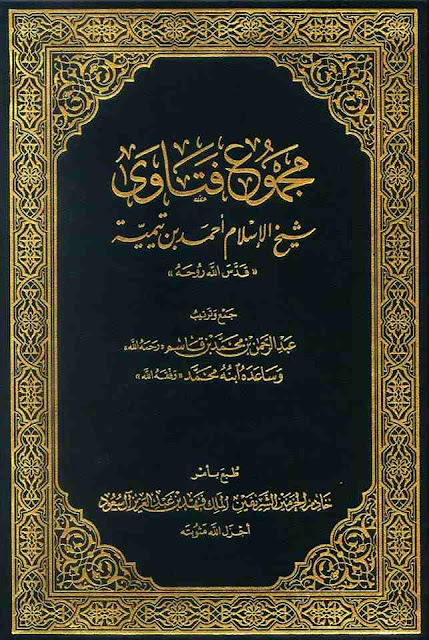 Footnote: It is narrated by Al-Tirmidhi, Salma is not known and the other narrators of it are Thiqa (Trustworthy). 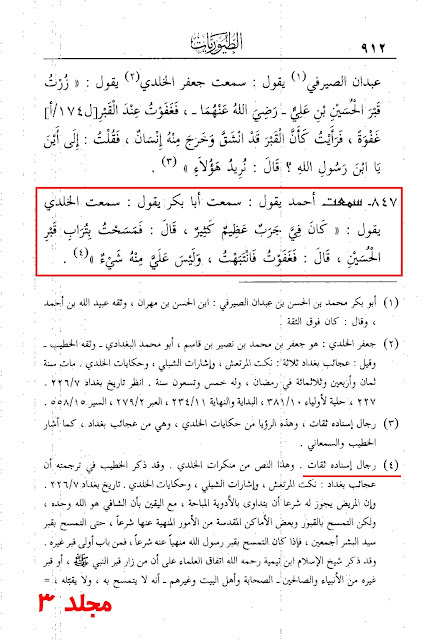 Footnote: Narrated in Mu'jam Al-Tabarani and it's narrators are Thiqa (Trustworthy) as Al-Haythami has said. 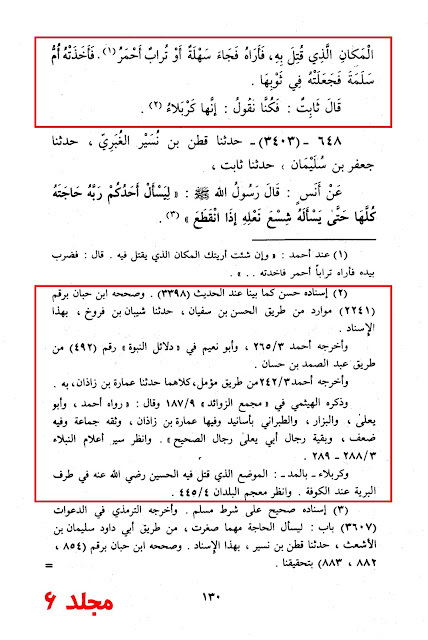 Source: Siyar A'lam An-Nubala. Vol. 3, Pg. # 316. This Salma is the wife of Abi Rafeh the servant of the Prophet (saw), and she was the midwife of Ibraheem the son of the Messenger of Allah (saw). Source: Mir'qatul Mafatih Sharh Mishkatul Masabih. Vol. 11, Pg. # 315. We accept this narration because of it's high ranking chain. 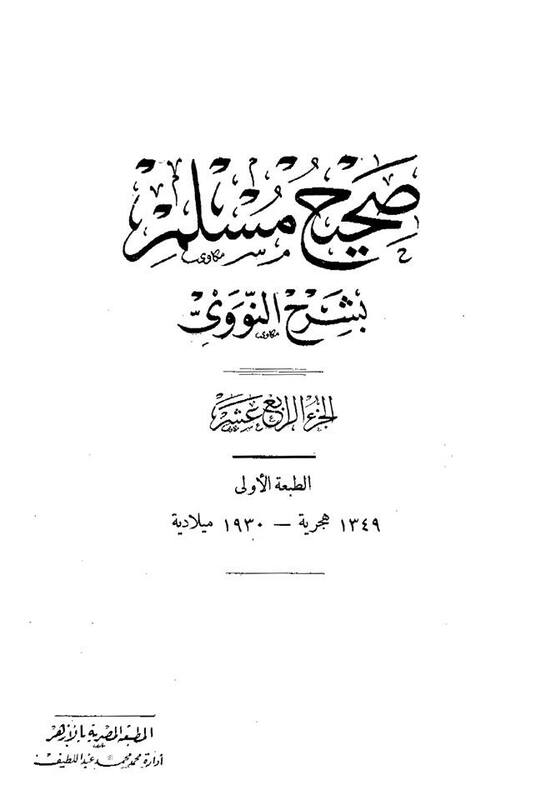 Source: Tahdeeb Al-Kamal of Al-Mizzi. Vol. 9, Pg. # 187. 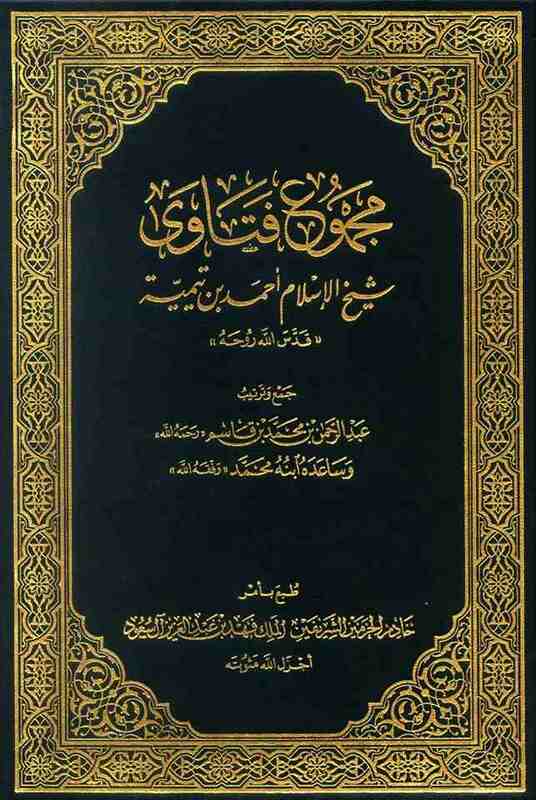 Al-Haythami: It's narrators are of the narrators of Saheeh (Trustworthy). 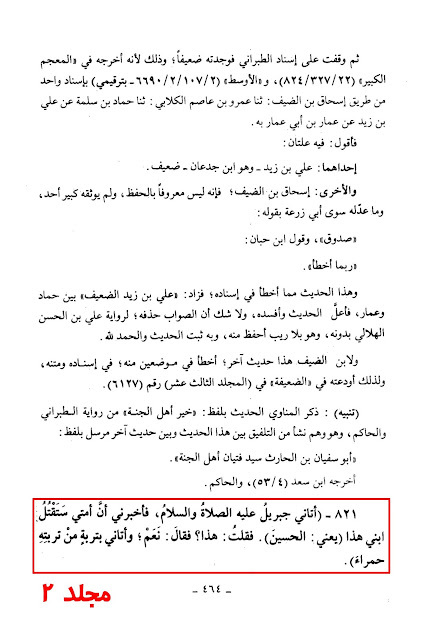 Source: Majma Al-Zawa'id. Vol. 9, Pg. # 234, H. # 15179 -15180. 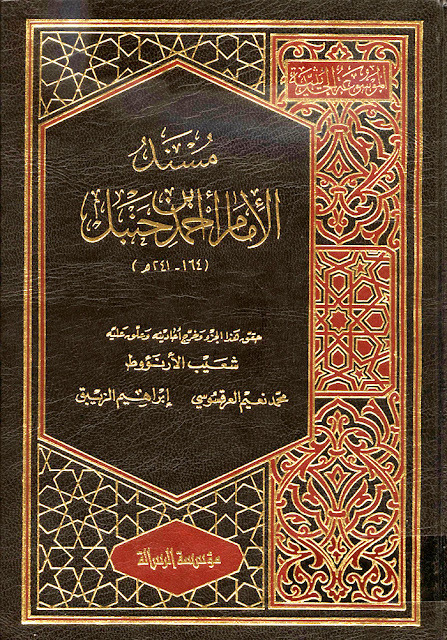 Al-Busayri: This is narrated by Abd Ibn Humayd through a Saheeh (Authentic) chain, and narrated by Ahmad ibn Hanbal, shorter from A'isha or Umm Al-Salamah (s.a). Source: Ithaf Al-Khairat Al-Mahrath. Vol. 9, Pg. # 319. Footnote: Narration is Saheeh (Authentic), Haythami has said: "This is narrated by Ahmad and Aboo Ya'la and Al-Bazzar and Al-Tabarani and its narrators are Thiqat (trustworthy), and Neji is not the only person who has narrated it." 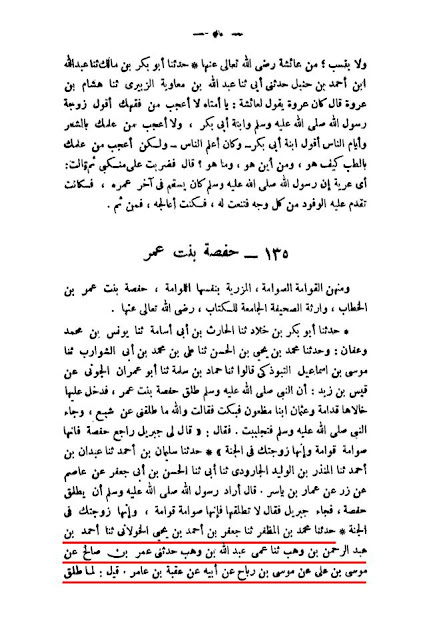 Source: Musnad Ahmad ibn Hanbal. Vol. 1, H. # 648, Pg. # 446. 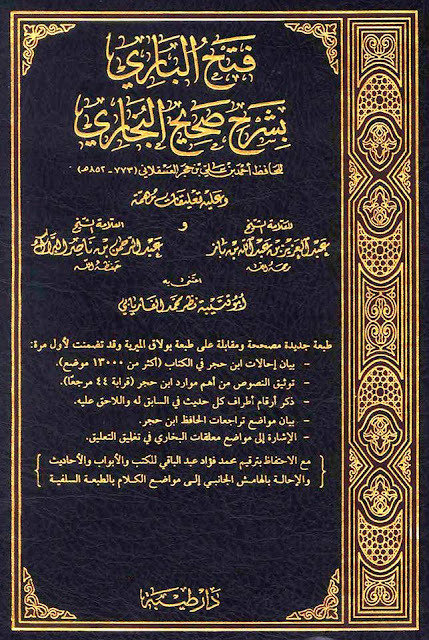 Al-Busayri: It is narrated by Aboo Bakr ibn Abi Shaiba and Ahmad Iin Hanbal and Aboo Yahla through a Saheeh (Authentic) chain. Al-Busayri: It is narrated by Aboo Bakr ibn Abi Shaiba and Ahmad ibn Hanbal and Ahmad ibn Moni' and Abd ibn Homayd through a Saheeh (Authentic) chain. Source: Ithaf Al-Khairat Al-Mahrath. Vol. 9, H 9054 - 9054, Pg. # 318. Prophet (saw) said, "Jibreel came to me and informed me that my Ummah (nation) will kill my son (Hussain) and he brought me some red soil from amongst (Hussain's) soil." 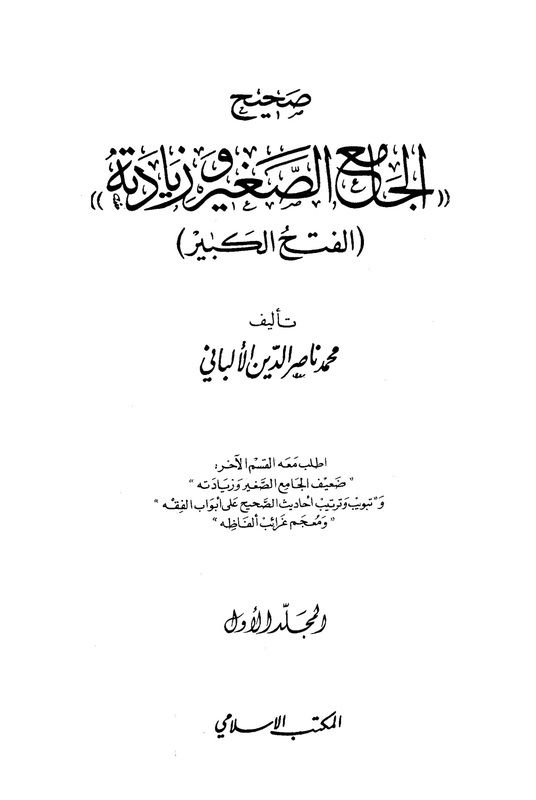 Al-Albani: Narration is Saheeh (Authentic). 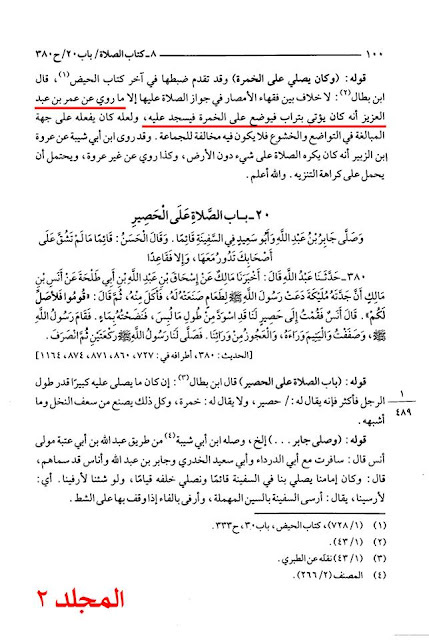 Source: Saheeh Al-Jamia Al-Saghir. Vol. 1, Pg. # 73. 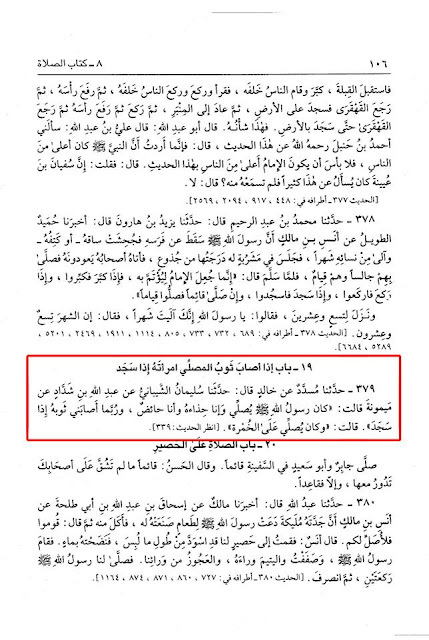 Note: We have also previously narrated a Hadeeth in which the Prophet (saw) was weeping profoundly (Musnad Ahmad ibn Hanbal. Vol. 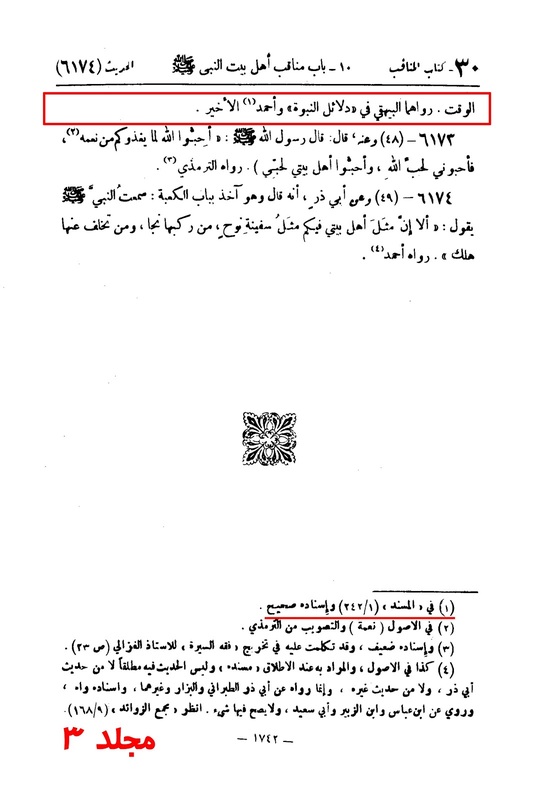 1, H. 648, Pg. # 446). However, Al-Albani has said this narration is weak because of Neji and nobody knows who he is, as Al-Dhahabi has mentioned him as trustworthy except ibn Hibban. His son is more famous then him, so if anyone authenticates this chain has made an error. 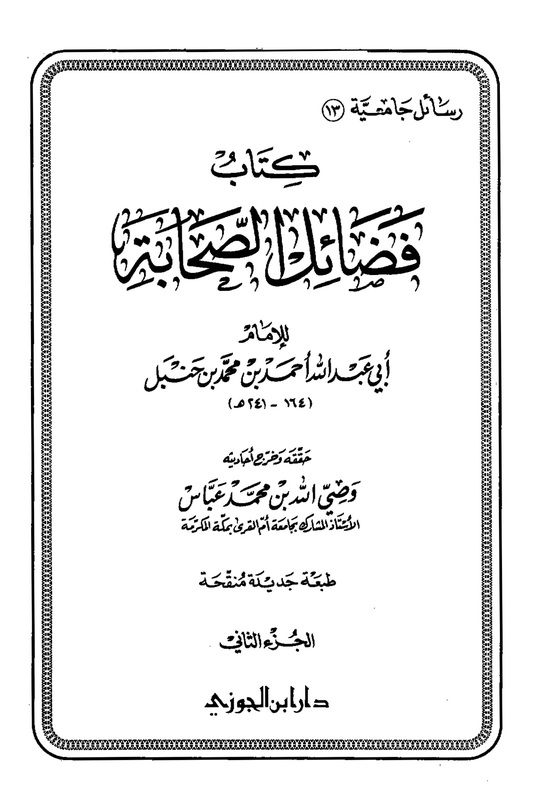 However, I (Al-Albani) say Haythami writes that Ahmad has narrated it as well as Aboo Ya'la, Bazzar and Tabarani and the narrators are all trustworthy (the next narration #822 comes later). 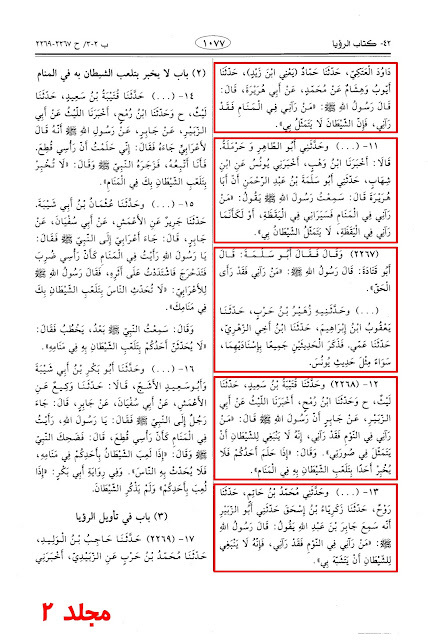 Source: Silsilat Al-Ahadith Al-Saheeh. Vol. 2, Pg. # 464. H. # 821. 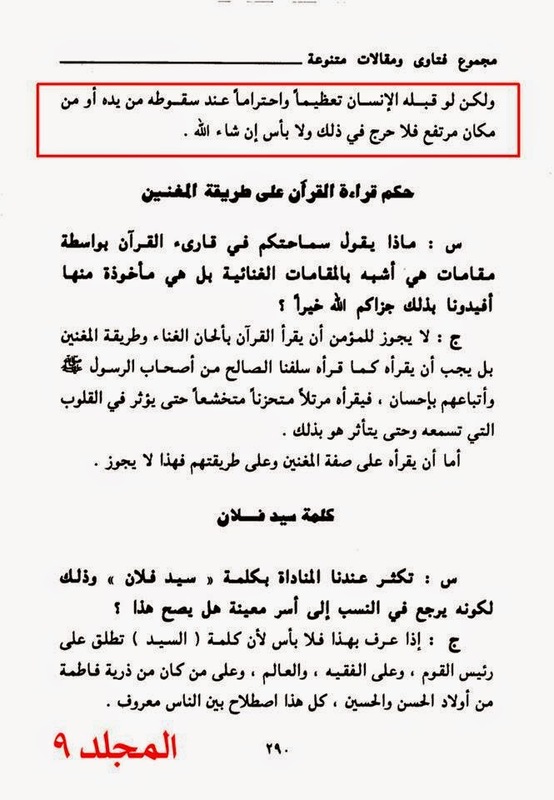 Narrated Aboo Al-Hussain Alee ibn Abdul Rahman Al-Shaybani in Kufa from Ahmad Ibn Hazim Al-Ghafari from Khalid Ibn Mukhlid Al-Qatwani from Abdullah ibn Wahab ibn Zam'a from Umm Al-Salama who said: 'One night the Messenger of Allah (saw) woke up suddenly from his sleep with fear and anxiety and after a while he slept again, then he woke up with less fear than the first time, then slept and woke up again after a while and in his hand there was red soil which he was smelling and kissing! Then I asked: "What is this soil O Messenger of Apostle of Allah (swt)? He said: "Jibreel (a.s) informed me that Hussain (a.s) will be killed in the soil of Iraq, then I said to Jibreel (a.s) show me the soil of the ground that Hussain (a.s) will be killed in it.' Then he gave me this soil. Al-Hakim: This narration is Saheeh (Authentic) by the criteria of Shaykhayn (i.e Bukhari and Muslim) but they have not narrated it. 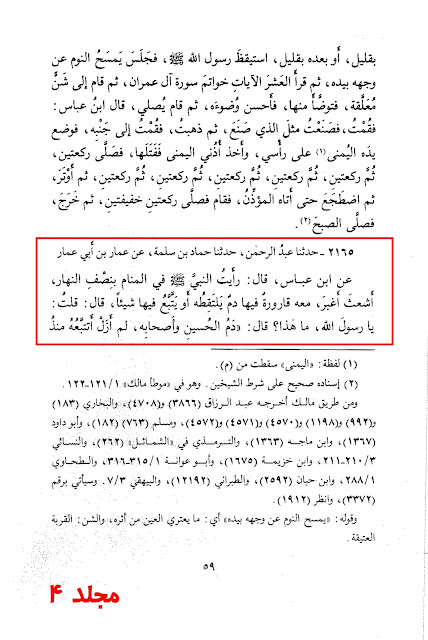 Al-Dhahabi: It is Saheeh (Authentic) by the criteria of Al-Bukhari and Muslim. 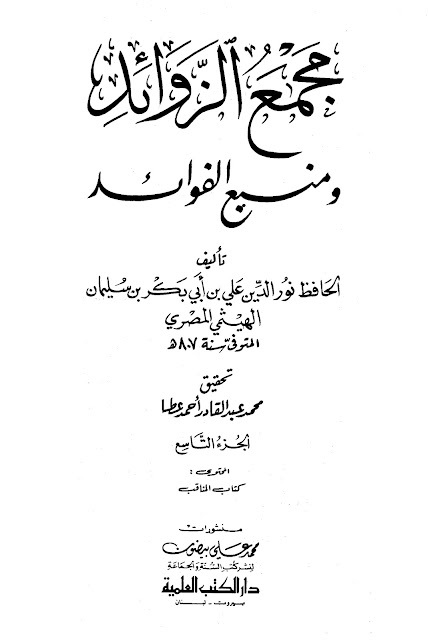 Source: Al-Mustadrak Alaa Al-Sahihain. Vol. 4, Pg. # 444. The narration in which Umm Salamah (r.a) witnessed the Prophet (saw) in fear and anxiety because he (saw) was informed by angel Jibra'eel (a.s) that Hussain (a.s) will be killed on the soil of Karbala, contains Abdullah bin Wahb bin Zama'a in the chain of narration who is Majhool Al-Hal (has an unknown status), and was not seen as trustworthy by any other than ibn Hibban. 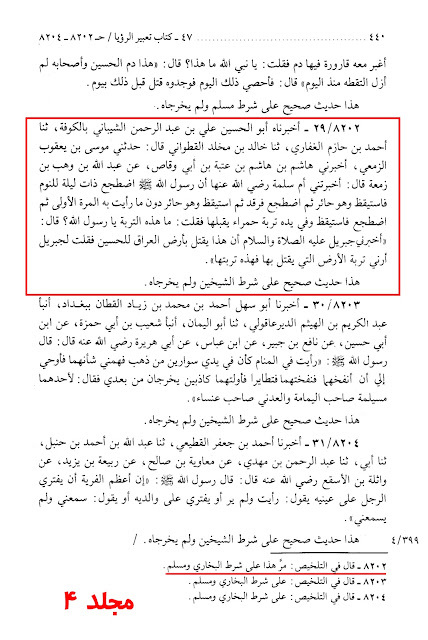 To claim that it was only ibn Hibban who said Abdullah bin Wahb bin Zama'a is trustworthy is misinformation and absolutely untrue. Abdullah bin Wahb bin Zama'a is a companion of the Prophet (saw) of the third generation and narrated from many other companions and the Prophet (saw) himself. We almost always find that when one deceitfully weakens someone, they most certainly get caught out in their own game. 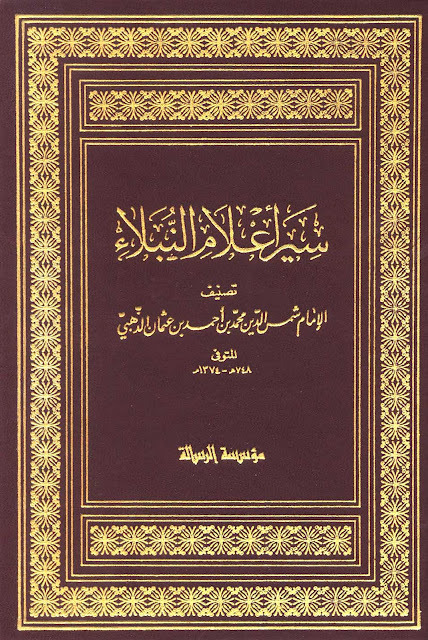 Abdullah ibn wahab ibn Zam'a ibn Al-Aswad ibn Al-Muttalib Al-Asdi Al-Asghar, he was the knowledgeable one of him tribe Asad & his brother Abdullah Al-Kabar was killed at Youm Al-Dar & he is a thiqah. 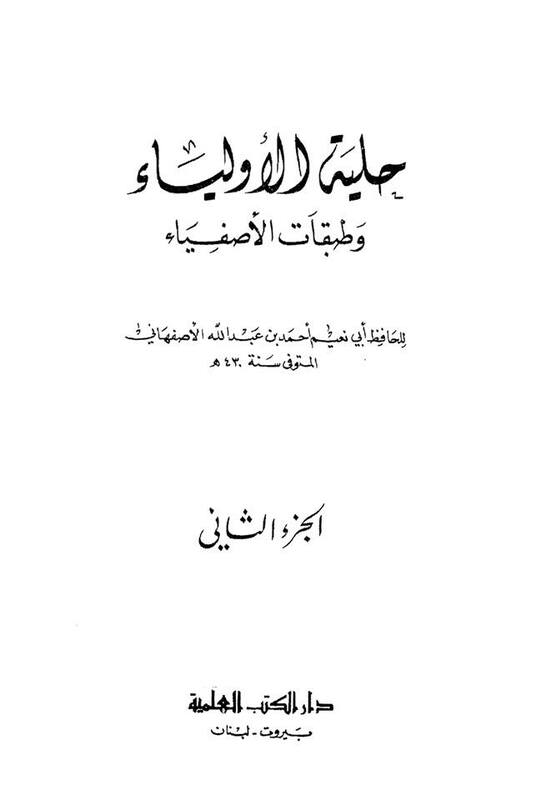 Abdullah ibn wahab ibn Zam'a ibn Al-Aswad ibn Al-Muttalib ibn Asd ibn Abd Al-Gazi Al-Qarshi Al-Asdi, he is Abdullah Al-Ashgar he has some narrations, as for the older brother he was more known. 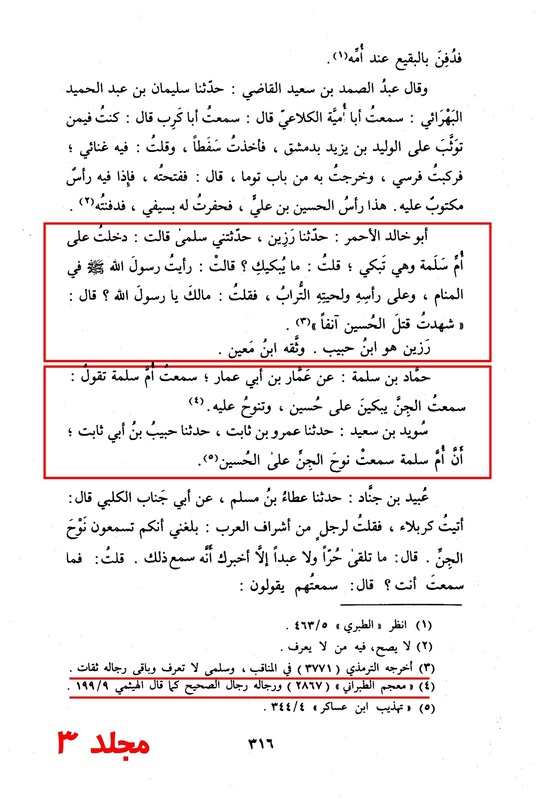 Abdullah ibn wahab ibn Zam'a Al-Asdi Al-Qarshi, he has heard from Umm Salamah (r.a), Musa ibn Ya'qub has said that Hashim ibn Hashim has said that Ya'qub ibn Abdullah Al-Asdi & his son Yazid & that Al-Zuhri has heard from them. According to an 8th century manuscript, the word is not "kissing" but "flipping" over. In Arabic both words are similar, one is يقلبها the other is يقبلها. 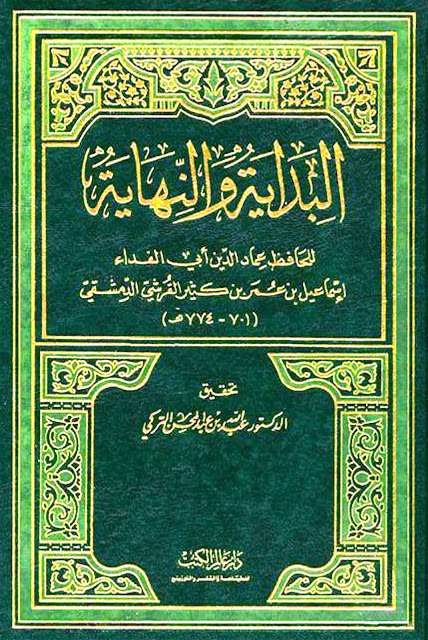 (Yuqalibuha/Yuqabiluha ). The letter Laam and the letter Baa have been switched over in the published version which completely changes the meaning of the sentence. 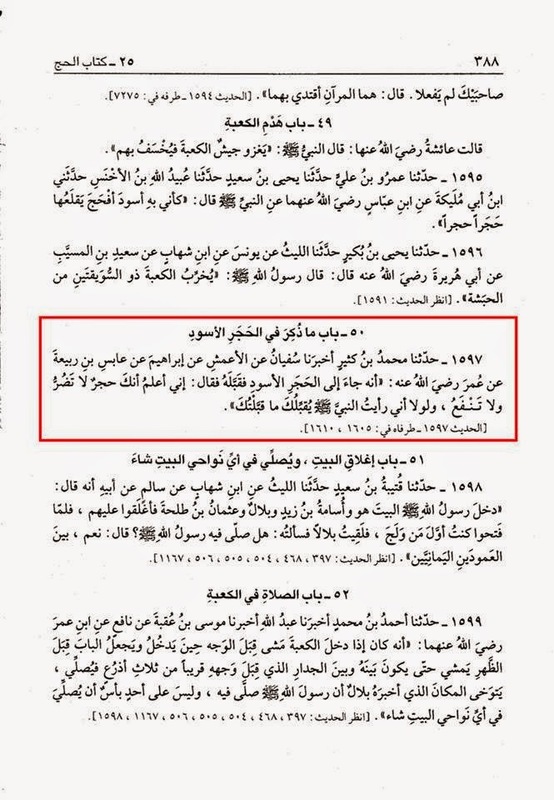 Even if we were to assume the text is 'flipping' it does not change the Hadeeth. The Prophet (saw) requested angel Jibra'eel (a.s) to bring him the soil, he (saw) smelt it and later Umm Salama (r.a) kept it close to her, which shows it held some significance to them. 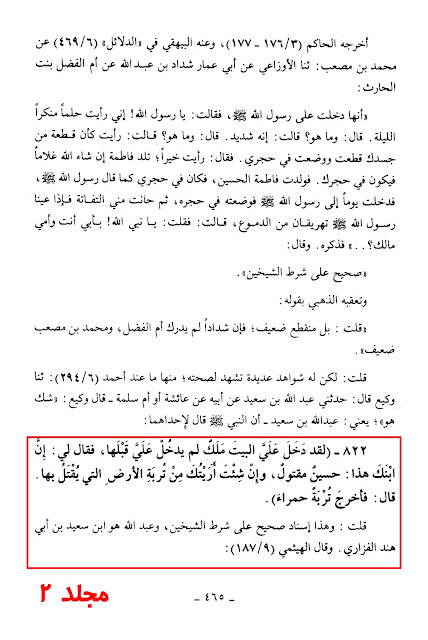 In fact kissing something out of reverence provided it does not contradict the Qur'aan and Sunnah is not regarded as a sin. 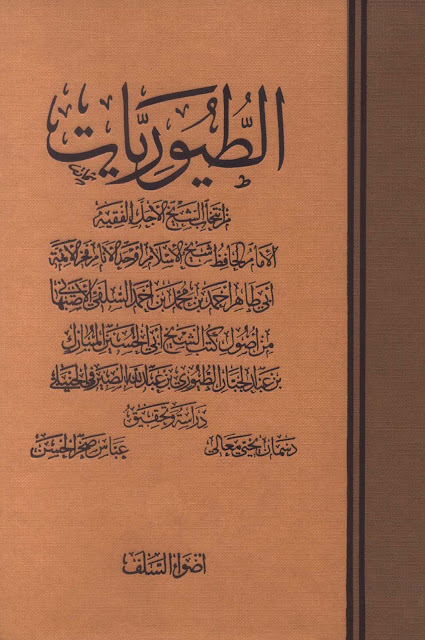 Is it Bid'ah (innovation) to kiss the Glorious Qur'an when opening and closing it? "I do not know of any evidence to indicate that kissing the Qur'an is prescribed in Shari'ah, but if a person does it, there is nothing wrong with that. It is narrated that the great companion Ikrimah ibn Abi Jahl used to kiss the Qur'aan, and he used to say, "This is the speech of my Lord." Anyway, there is nothing wrong with kissing the Qur'an, but it is not prescribed to do so and there is nothing to indicate that it is prescribed in Shari'ah. Therefore, if a person kisses it as an act of veneration and respect if it falls from his/her hand or from a high place, there is nothing wrong with that, Insha'Allah." 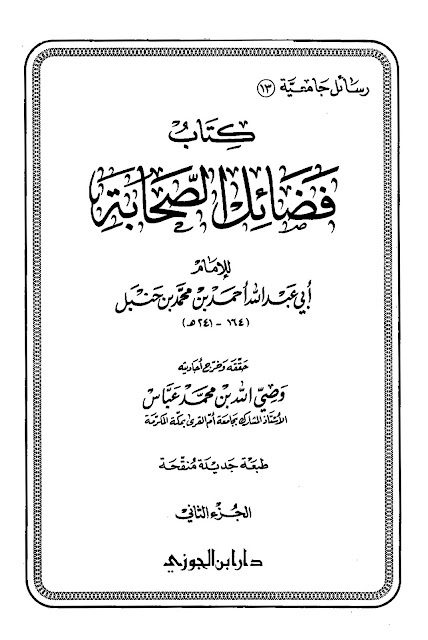 Source: Majmoo' Fataawa wa Maqaalaat Mutanawwi'ah li Samaahat. Vol. 9, Pg. # 289. Narrated Anas ibn Malik: The angel of rain requested permission from Allah to visit the Prophet (saw). Permission was granted to him. The angel came to the Prophet (saw) while he was at Umm Salama's. 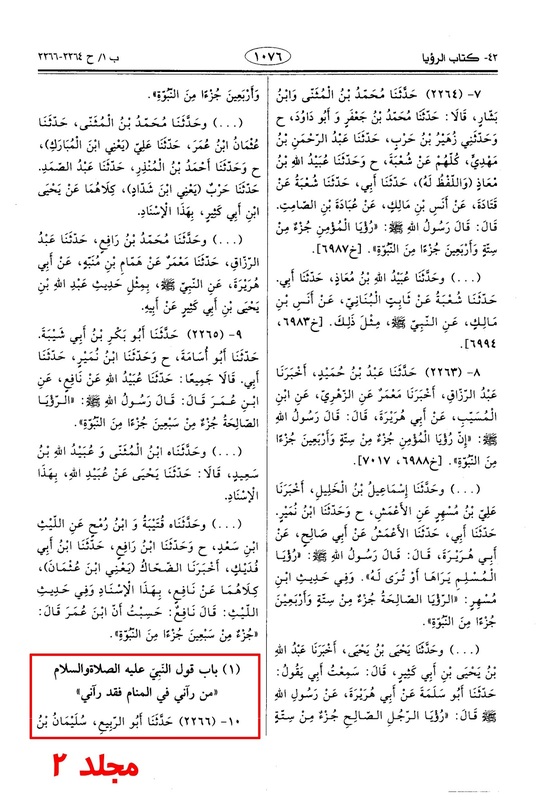 The Prophet asked Umm Salama to make sure no one enters the room. However, Al-Hussain opened the door and entered. 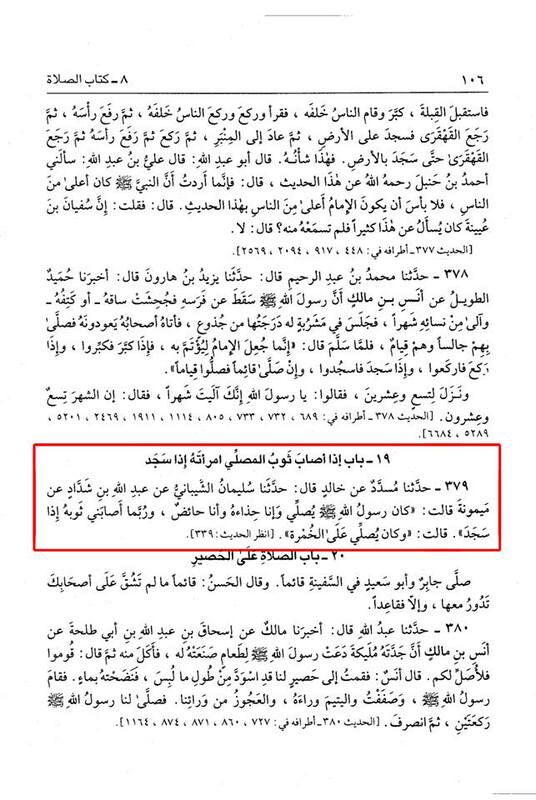 He started to jump on the back of the Prophet (saw) and his shoulders. 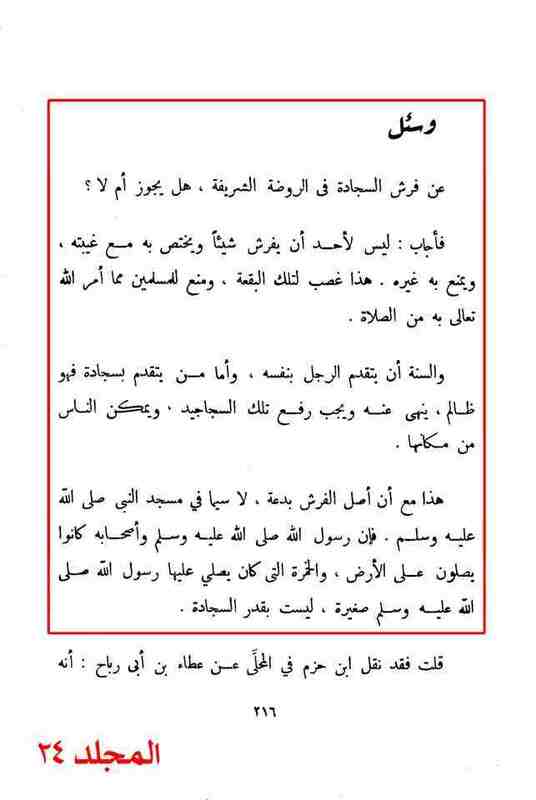 The angel asked the Prophet saw): Do you love him? The Prophet (saw) answered: Yes. The angel said: Your Ummah (nation) will kill him. If you want I can show you the land he (Hussain) will be killed on. The angel gave him (saw) a sample of a red soil. Umm Salama took the sample and kept it in her garment. 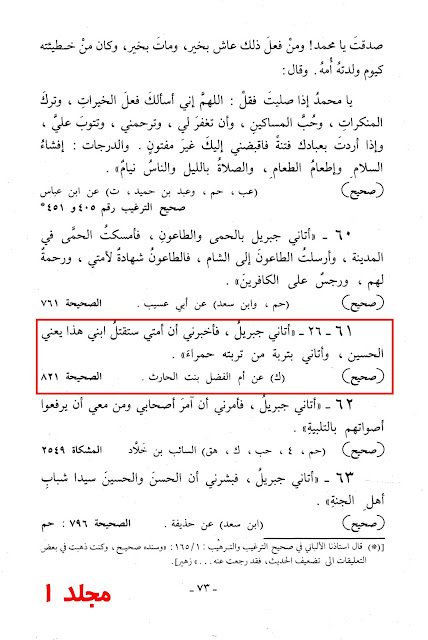 Thabit said: 'We used to say it was Karbala.'" Thabit said: "We were told it was from Karbala." 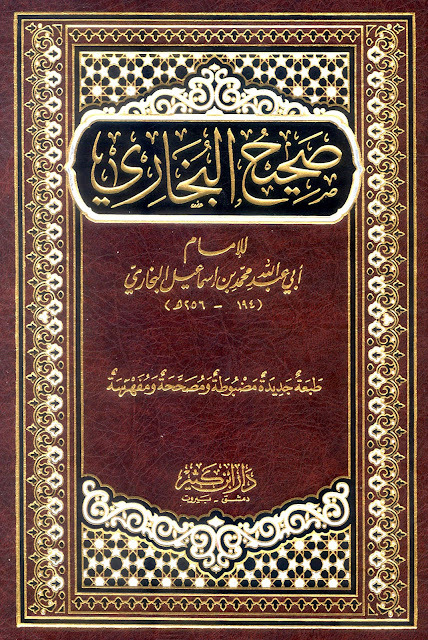 Al-Haythami: It is narrated Ahmad, Aboo Ya'la, Bazzar, Tabarani with chains containing Imaarah whom numerous scholars have authenticated him. 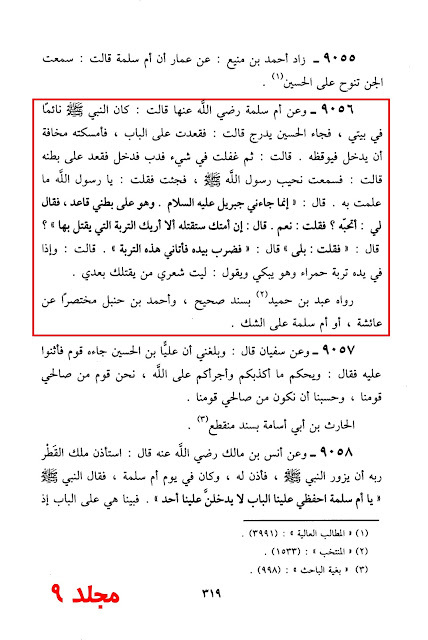 This is the same Imaarah ibn Zaathan we talked about that has some weakness in him. And the rest of the narrators are all Trustworthy. 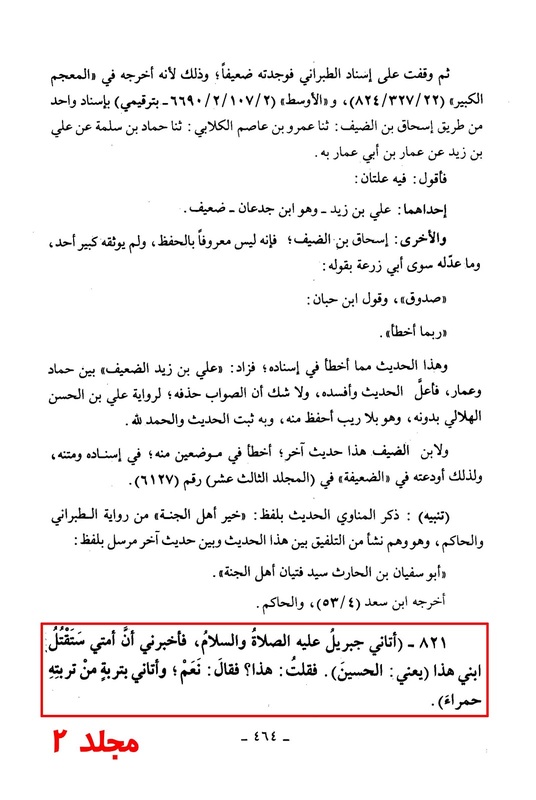 Source: Majma Al-Zawa'id. Vol. 9, Pg. # 217, H. # 15111. 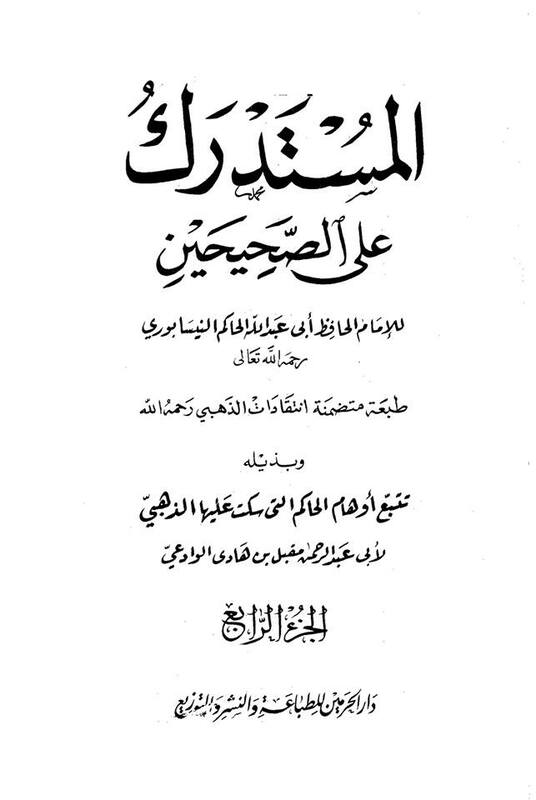 Al-Albani: The chain of this narration is Saheeh (Authentic) by the criteria of Al-Shaykhayn (i.e Bukhari and Muslim), Abdullah is Sa'eed ibn Abi Hind Al-Farazi and Al-Haythami has said: "It is narrated by Ahmad, and it's narrators are the narrators of Saheeh (Authentic)." 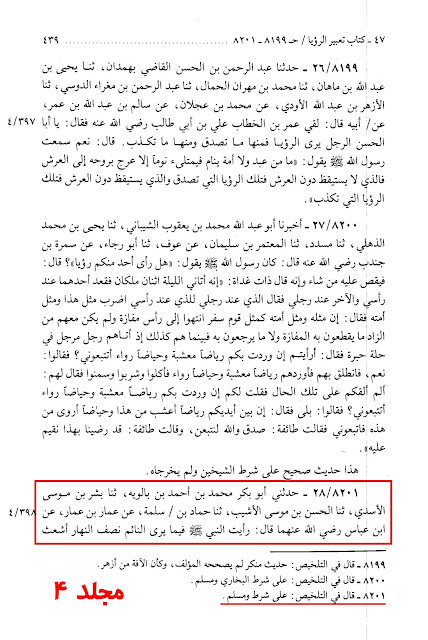 And there is another witness for this narration through Anas like this. 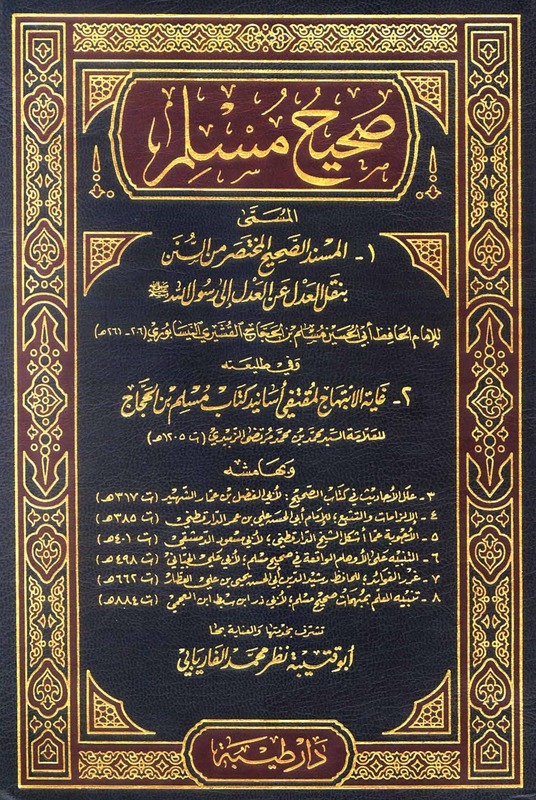 Ahmad has narrated through Ammara Ibn Zazaan narrated from him Thabit. 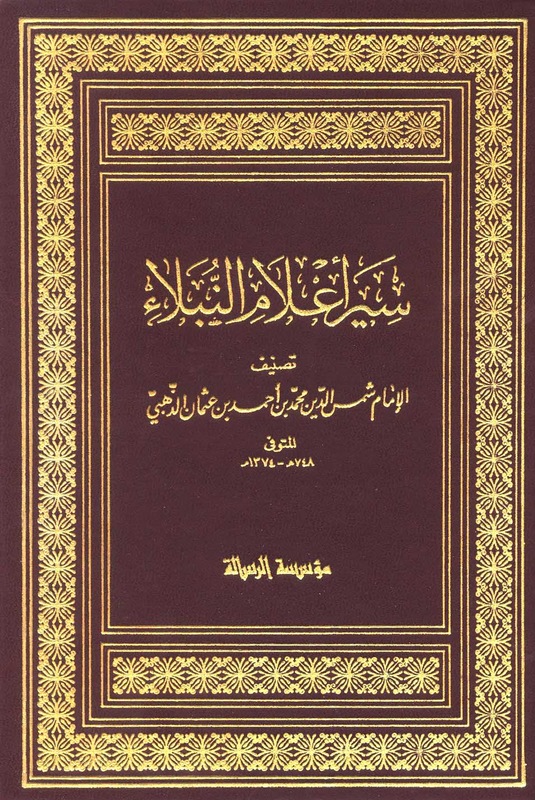 And Ammara is truthful and has many mistakes as it is said in "Al-Taqreeb." 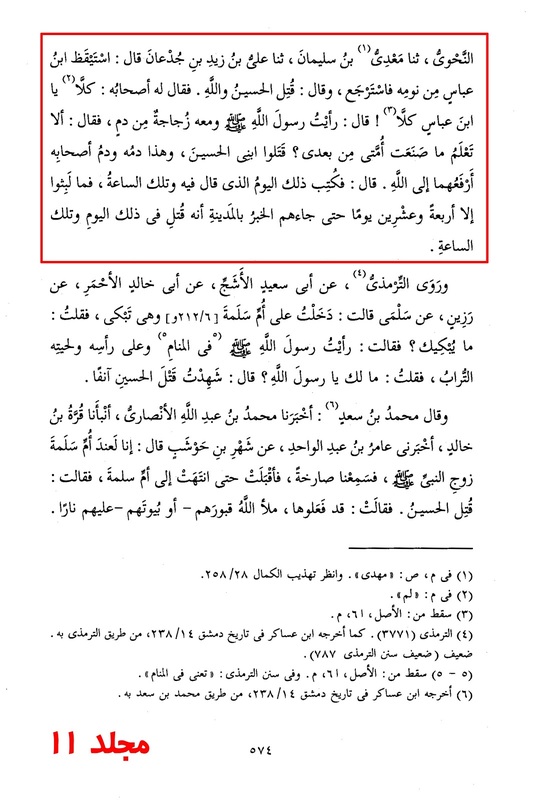 And there is another witness through the narration of Abdullah ibn Naji from his father who was accompanying Alee (as); When they reached Naynawa... he said: "I once entered to the Prophet (saw) and his eyes were overflowing...." This is narrated by Ahmad, and I say: 'Its narrators are Thiqat (Trustworthy), except for Naji, about whom Al-Hafiz (Ibn Hajar) has said: "He is acceptable." 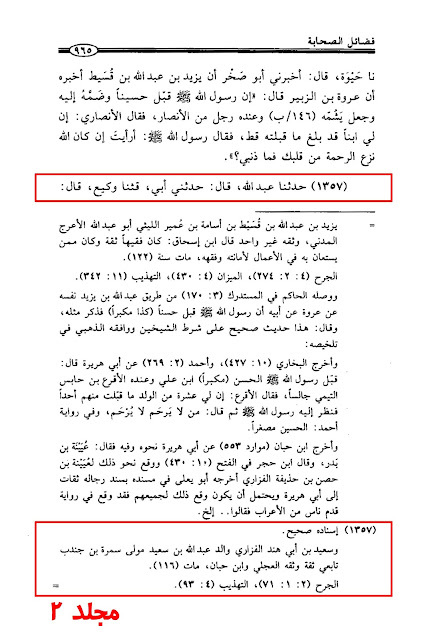 Meaning that when there are other witnesses for his narrations they are acceptable, and in this case his narration has other witnesses, because Al-Haythami has said: "This is narrated by Ahmad and Aboo Ya'la and Al-Bazzar and Al-Tabarani and its narrators are Thiqat, and Naji is not the only person who has narrated it." Then he mentions the narration of Umm Al-Salama and a narration from Aboo Tufayl and says: "It's chain is Hasan (Reliable)." 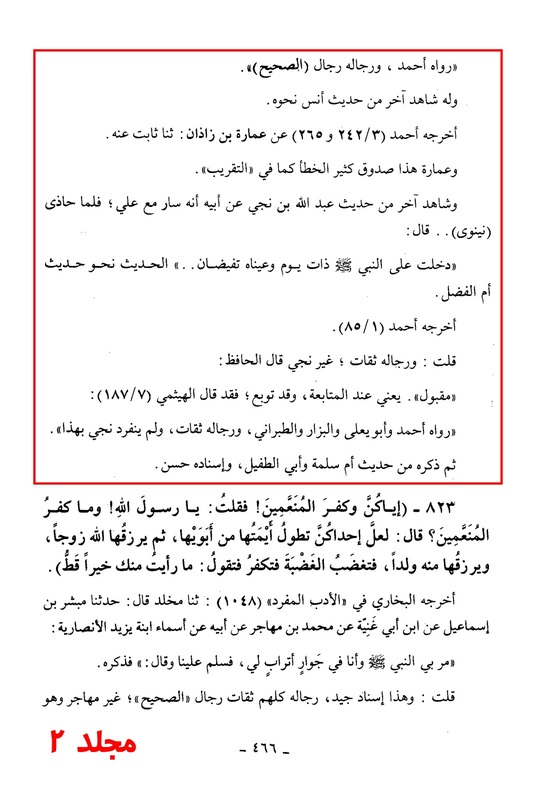 Source: Silsilat Al-Ahadith Al-Saheeh. Vol. 2, Pg. # 465 - 466. 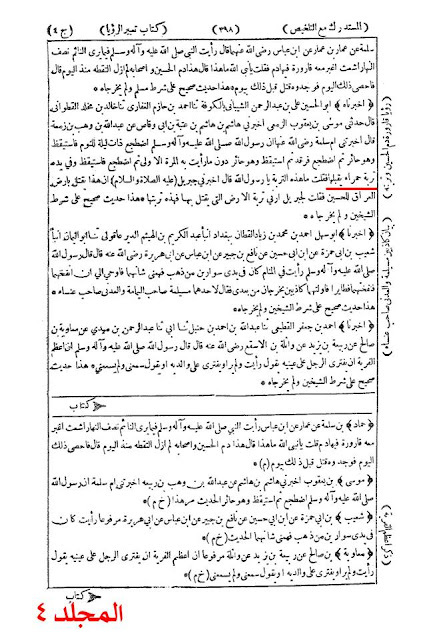 Source: Fada'il Al-Sahaba. Vol. 2, Pg. # 965 - 966. H. # 1357. Earth, soil and dust from various places has certain elements of cure, and is not exclusive to the dust/mud of Karbala. 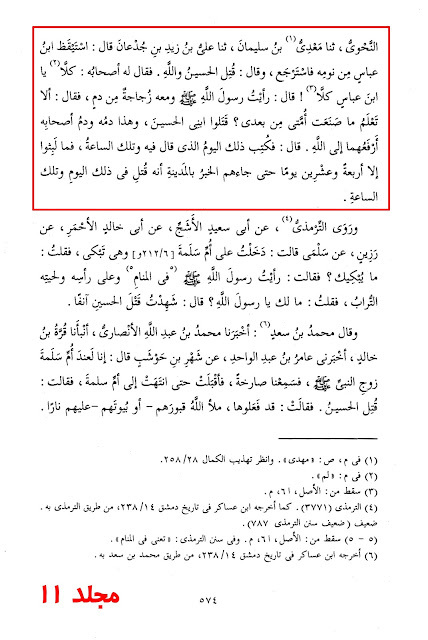 Despite this, there is no evidence to suggest the Prophet (saw) wiped himself with the mud, ate it, or used the mud to cure himself when he got sick. Generally, earth, soil and dirt are three words for the same material, the portion of the earth's surface consisting of disintegrated rock and humus. Earth, soil and dirt make up land. Mud is earth, soil or dirt mixed with a liquid such as water. The Shi'a venerate the earth of Karbala in order to receive blessings since the Prophet (saw) and the Imams (a.s) gave it great importance. It has also been encouraged for the Shi'a to perform prostration on with the understanding that it is not compulsory as it can be anything natural, but with a view to achieving greater recompense. Even the wife of the Prophet (saw) kept the soil of Karbala with her. One must question, if the soil was of no significance why did Umm Salama (r.a) not want to get rid of it and throw it out on the streets? Rather, she held it in great regard and collected it in her clothes. Narrated Anas ibn Malik "The angel of rain asked his Lord permission to visit the Prophet (saw) and this day he was with Umm Salama (r.a), the mother of believers. The Prophet (saw) told her: "Guard the door and do not let anyone come in!" He said: "While she was at the door, Hussain ibn Alee (a.s) rushed into the room. 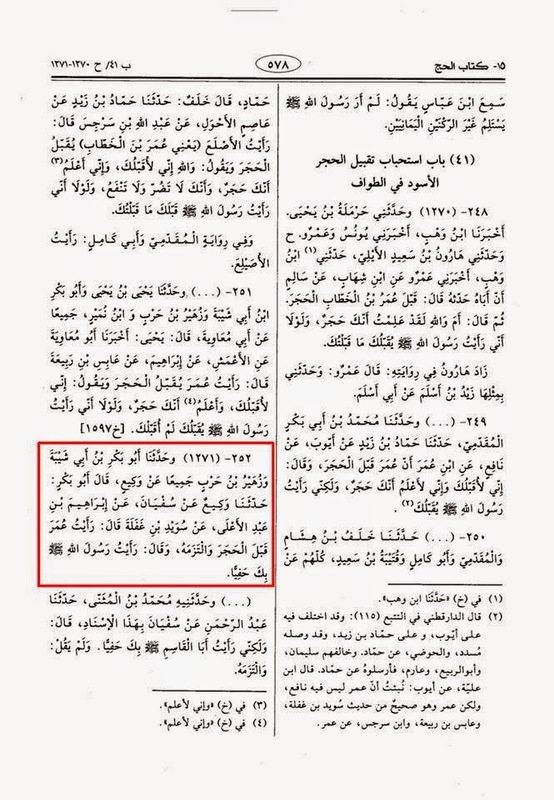 So the Prophet (saw) began to hug and kiss him. The angel said, "Do you love him?" He (saw) "Yes!" The angel said, "Your Ummah (nation) will kill him." He (angel of rain) said: "If you wish, I will show you in which place they will kill him (Hussain)." He (saw) said "Yes!" The angel took a handful of soil from the place in which he was killed and showed it. It was a red soil, so Umm Salama (r.a) took it and collected it in her clothes. 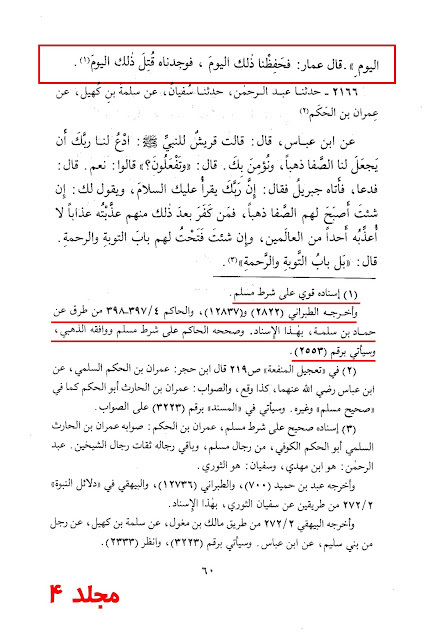 Footnote: It's chain is Hasan (Reliable) as we said in hadeeth number 3398. 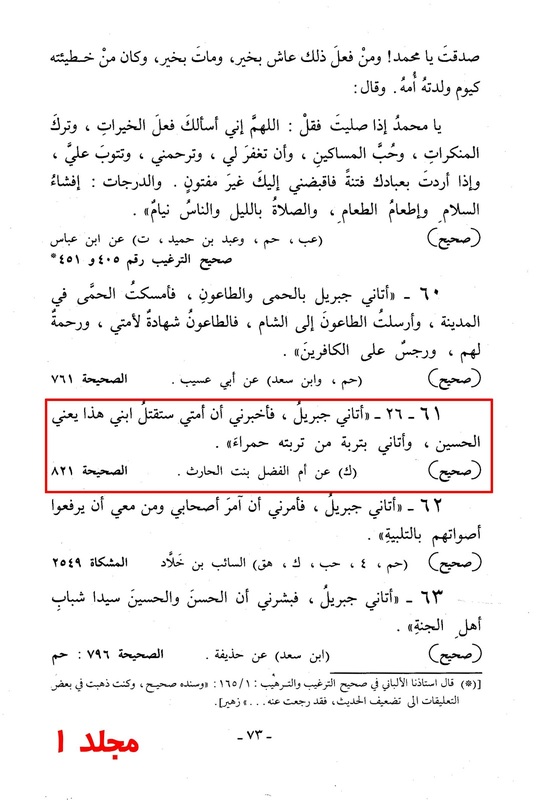 Ibn Hibban has authenticated it by the number of 2231. 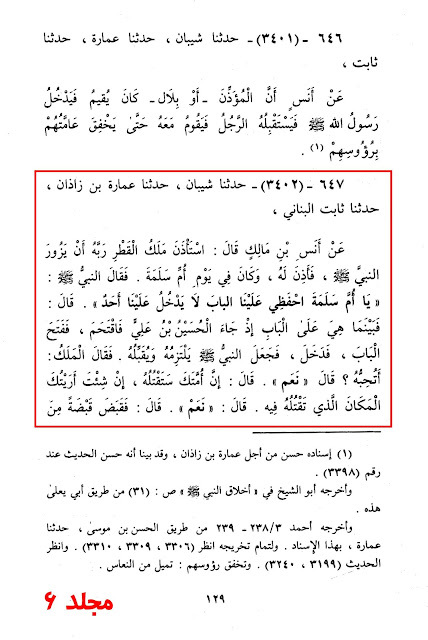 Another chain through Al-Hassan ibn Sufyan from Shayban ibn Furukh is like this chain. 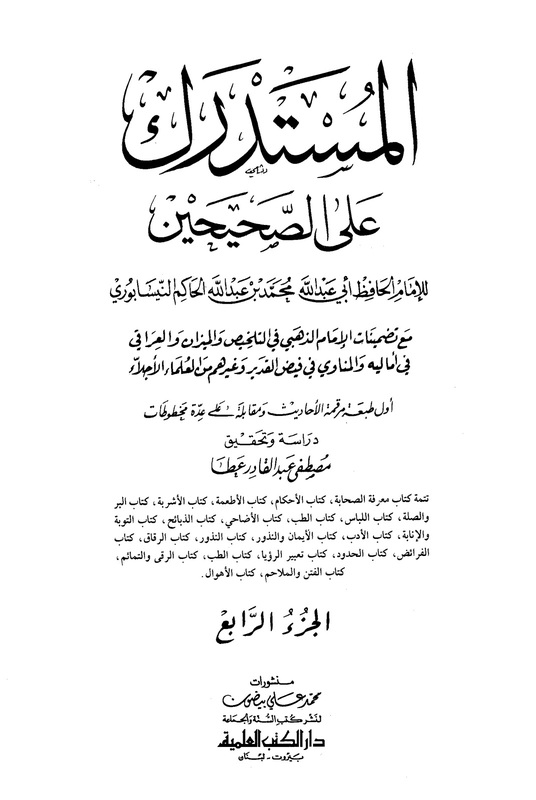 It is narrated by Ahmad and Aboo No'aim in "Dalahil Al-Nubuwwah" through Abdul Samad ibn Hisan and Ahmad also narrated it through Mo'mal, both from Ammara ibn Zaathaan. Al-Haythami mentions it in Majma Al-Zawa'id and says: Ahmad has narrated it and Aboo Ya'la and Bazzar and Tabarani with chains through Ammara bin Zaathaan, a group of scholars have stated he is Thiqah (Trustworthy) and him there is is some weakness and the rest of the narrators of Aboo Ya'la are Authentic. 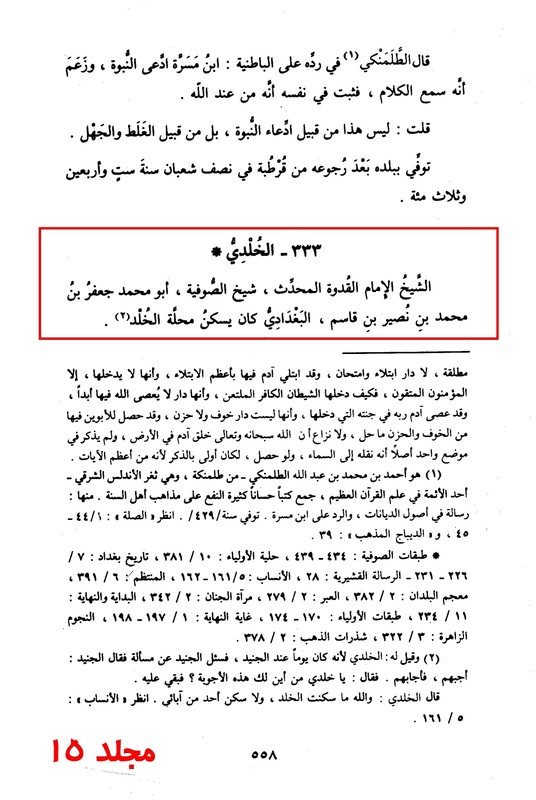 Source: Musnad Aboo Ya'la Al-Mawsili. Vol. 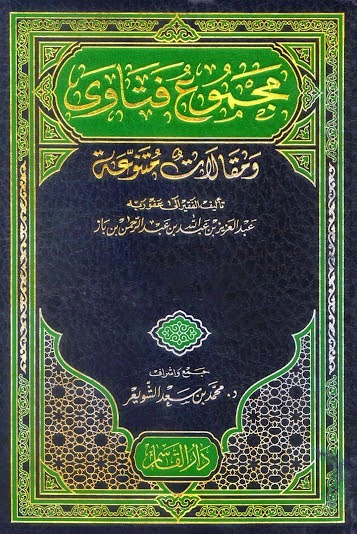 6, Pg. # 129, # 647. To hold distinction of earth from a holy place is not something unusual. The companions also shared this view. 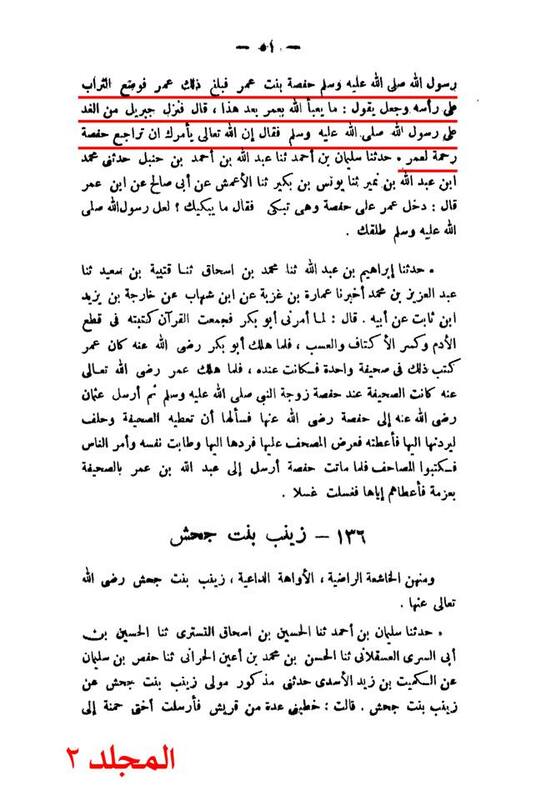 Hence, those who question and mock the followers of the Ahlulbayt (a.s) for believing the soil of Karbala is of great importance must also question and mock the same companions who believed in the blessings of the earth of Makkah and Madinah. 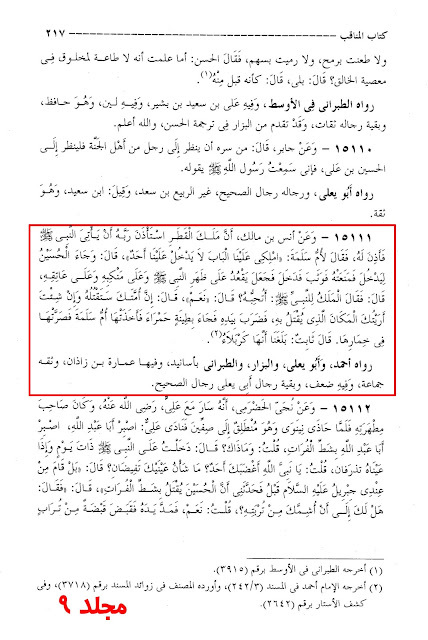 In addition to the companions, scholars also held a view that ANY land carries a blessing. It is a wonder why others become irritated by the Shi'a, who appreciate the land of Karbala for this very reason. 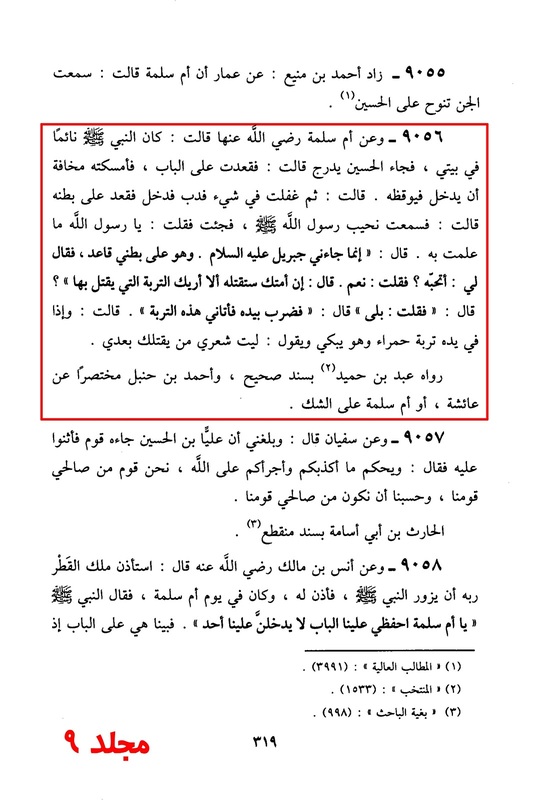 A'isha reported that when any person fell ill with a disease or he had any ailment or he had any injury, the Apostle of Allah (may peace be upon him) placed his forefinger upon the ground and then lifted it by reciting the name of Allah (swt) (and said): "The dust of our ground with the saliva of any one of us would serve as a means whereby our illness would be cured with the sanction of Allah (swt)." 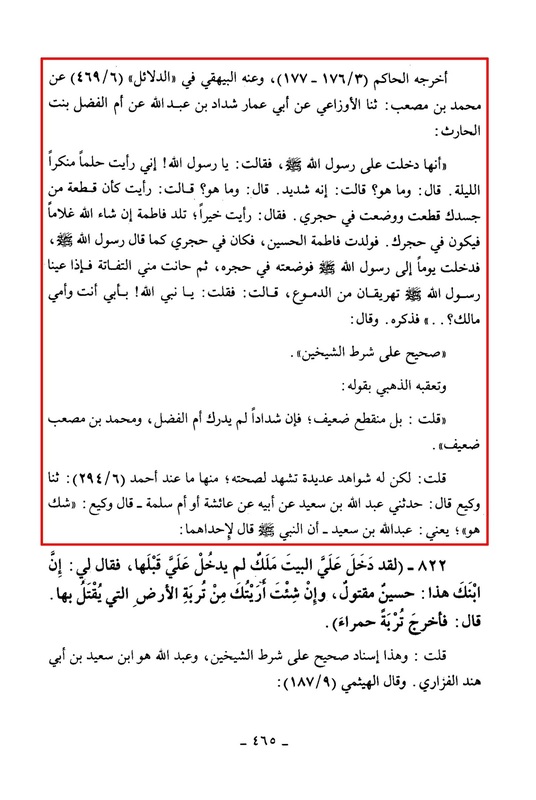 This hadith has been transmitted on the authority of ibn Abu Shaiba and Zubair with a slight variation of wording. Source: Saheeh Muslim. Pg. # 1046, H. # 2194. Narrated A'isha: The Prophet (saw) used to say to the patient, "In the Name of Allah (swt), The earth of our land and the saliva of some of us cure our patient." Narrated A'isha: Allah's Apostle used to read in his Ruqya (saliva), "In the Name of Allah, The earth of our land and the saliva of some of us cure our patient with the permission of our Lord." with a slight shower of saliva) while treating with a Ruqya. Source: Saheeh Bukhari. Pg. # 1454, H. # 5745 - 5746. 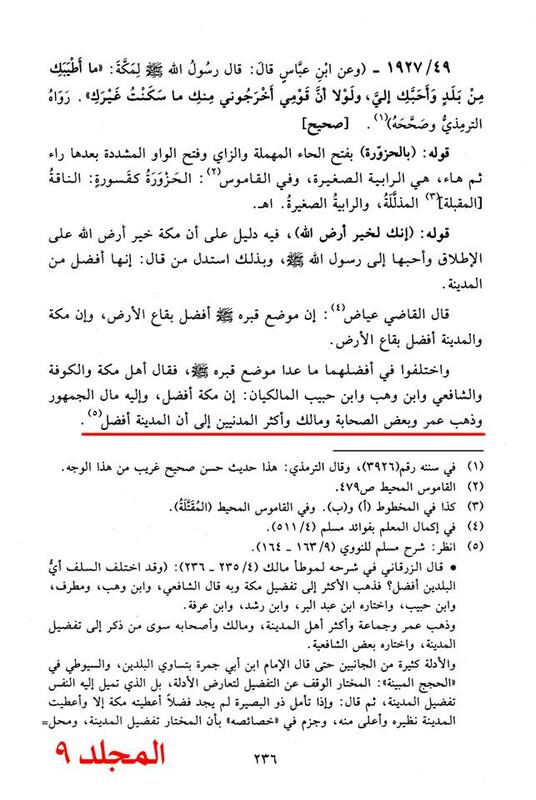 Aboo Bakr Al-Abhary Al-Maliki argued that Madinah is better than Makkah because the Prophet (peace and prayers of Allah be upon him) was created from the Madinah's argil and he (saw) is the best among human kind. Therefore, his (saw) argil is the best. His (saw) argil being the best among all argil is non-questionable. However, the debate is whether that makes Madinah better than Makkah or not, because having two things in vicinity and one of them having the same qualities of the other will lead us to say that it is because of their vicinity, therefore anything in immediate vicinity of Madinah would be better than anything in immediate vicinity of Makkah, and this was the answer of many recent scholars and it is worth examination. 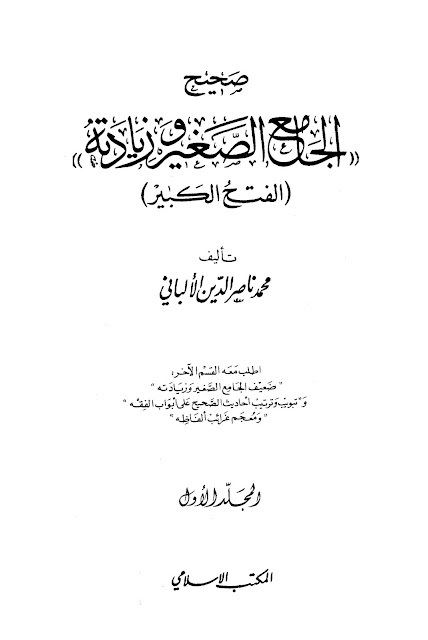 Source: Fath Al-Bari. Part 18, Pg. # 223. Al-Qady Ayyad said that they consented that the Prophets (saw) grave has more courtesy than any other place on Earth, and that Makkah and Madinah are the most excellent areas among all areas and they disagreed about the better one [Makkah or Madinah] except his (saw) grave (peace and prayers of Allah be upon him). 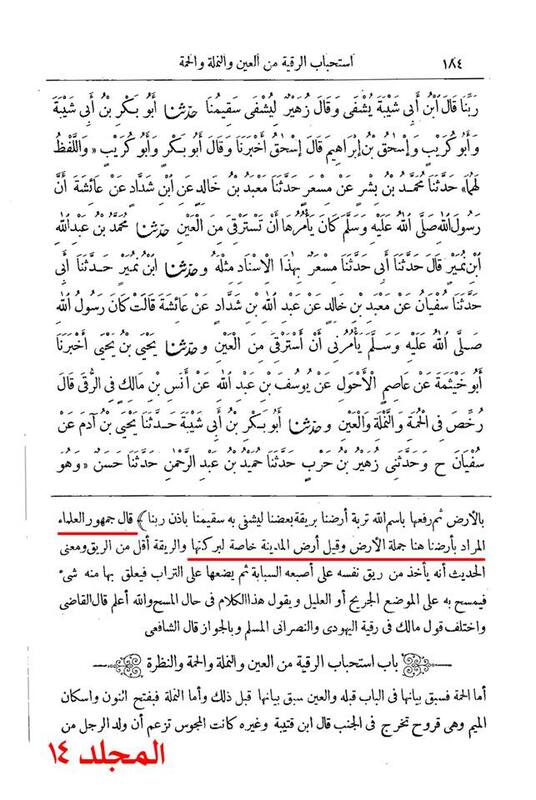 Then Umar and some companions and Malik and most of the Madinah people said that Madinah is better and the people of Makkah and Kufa and Al-Shafi'i and ibn Wahab and ibn Habib [both are Maliki] that Makkah is more excellent. Source: Sharh Muslim. Vol. 14, Pg. # 183. 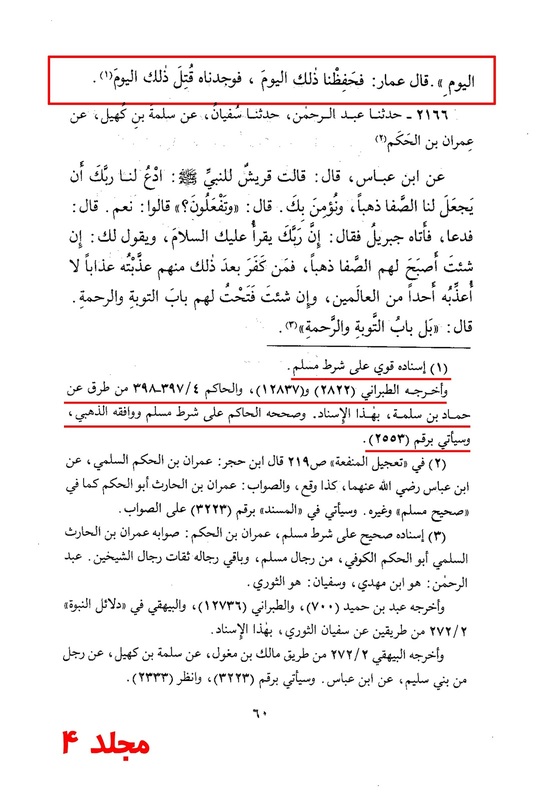 Umar and some companions and Malik and most of the Madinah folk said that Madinah has higher courtesy. 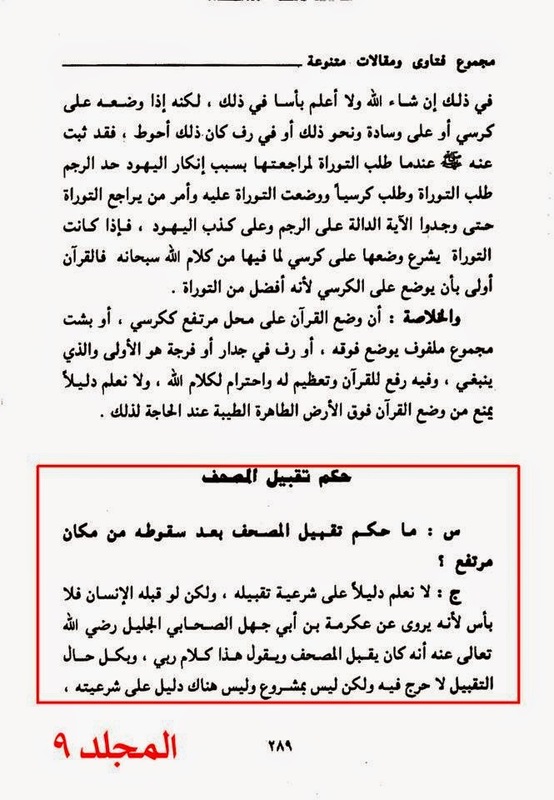 Source: Nayl Al-Awtar. Vol.9. Pg. # 236. The mud/dust found in the city of Karbala has some extraordinary value, in that it is a cure for every illness and a source of Barakah (blessing) and Divine mercy. As Shi'ee, we believe that the most perfect method of prostration is to place ones head upon the earth or anything natural created by Allah (swt) (excluding that which can be worn or eaten) as opposed to something like man-made carpets. According to the school of the Ahlulbayt (a.s) it is not compulsory to do prostration on the soil of Karbala however it is highly recommended. We shall now demonstrate some examples wherein the Turbah was used as a source of prostration and healing. He was asked about unfolding the prayer carpet in the Prophetic Rawdah. It is not allowed for anyone to spread his prayer carpet or anything related to him during his absence. This is a violation of the regulations of this area and prohibition for Muslims to apply the orders of Allah the Highest about praying. And the one who puts a carpet is unjust, and should be inhibited from doing so. And those carpets should be removed, and people should be able to use the space it occupies, keeping in mind that spreading carpets in its origin is an innovation especially if it was in the Prophet's (saw) mosque, because the Messenger of Allah (saw) and his companions used to do their prayers on the ground, and the piece of tissue that the Messenger of Allah (peace and prayers of Allah be upon him) used to perform his prayers over, was smaller than a carpet. 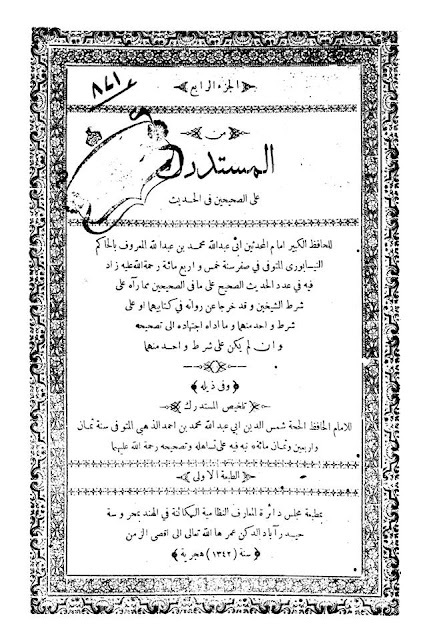 Source: Majmu Al-Fatawa. Vol. 25, Pg. # 216. Narrated Anas bin Malik: We used to pray with the Prophet (saw) in scorching heat, and if someone of us could not put his face on the earth (because of the heat) then he would spread his clothes and prostrate over them. 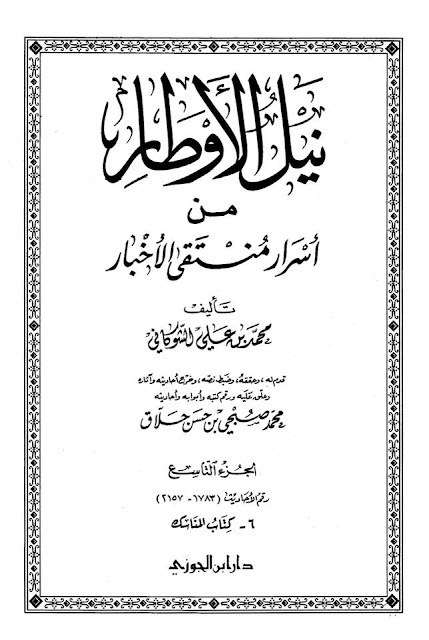 Source: Saheeh Bukhari. Pg. # 291. H. # 1208. According to the hadeeth above, it is only in exceptional circumstances that the Prophet (saw) and his companions would prostrate on cloth. 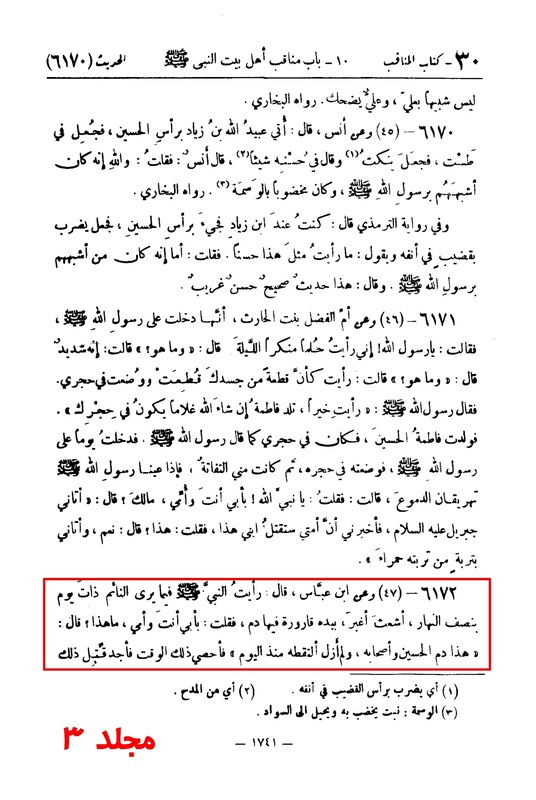 The Prophet (saw) also used to have a Khumra on which he would place his forehead for prostration. 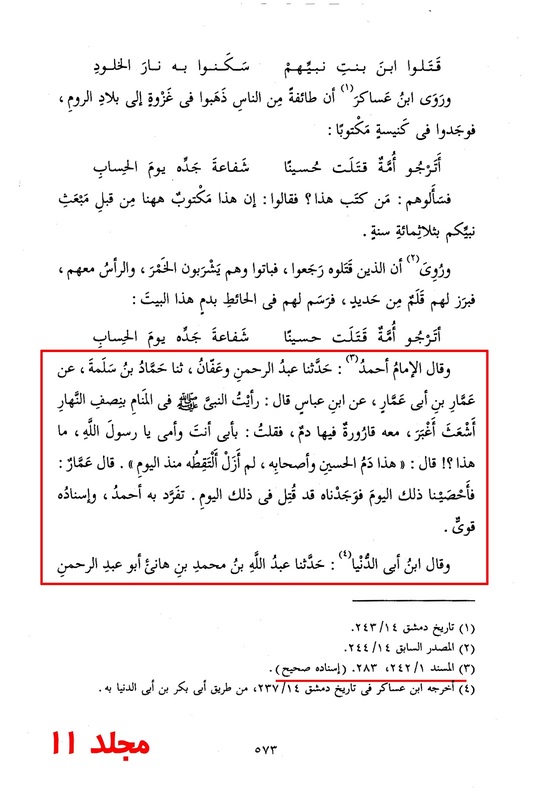 Narrates Abdullah bin Shaddad: Maimuna said, "Allah's Apostle was praying while I was in my menses, sitting beside him and sometimes his clothes would touch me during his prostration." Maimuna added, "He prayed on a Khumra (a small mat sufficient just for the face and the hands while prostrating during prayers). 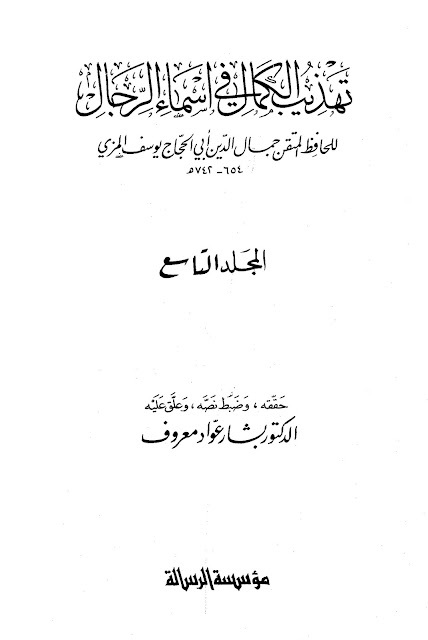 Source: Saheeh Bukhari. Pg. # 106. H. # 379. It is narrated that Umar ibn Abd-ul-Azeez used to be brought some soil that he puts on the veil and prostrate over the soil. 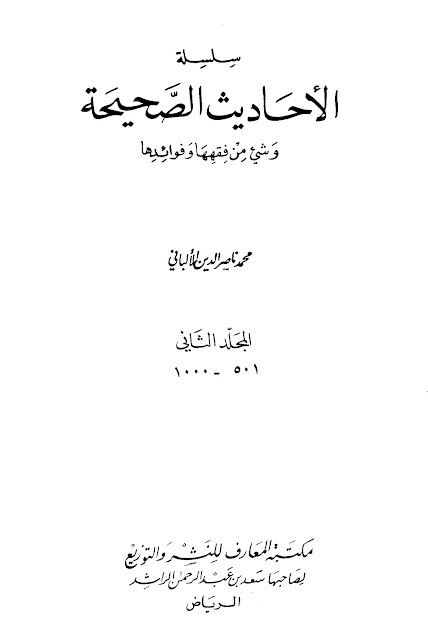 Source: Fath Al-Bari. Vol. 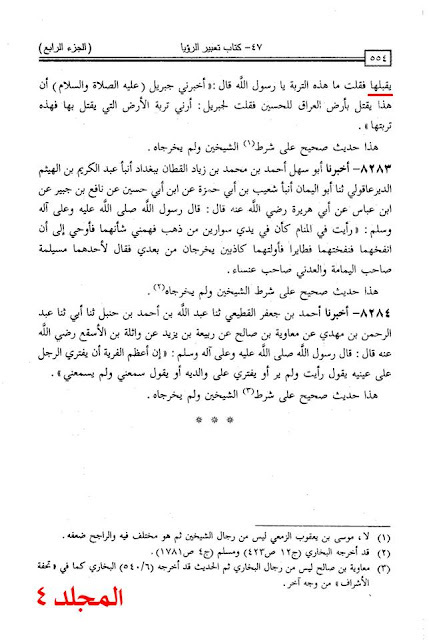 2, Pg. # 100. I heard Ahmad say: I heard Aboo Bakr say: I heard Al-Khuld (Aboo Ja'far) say: "I had much of a great itch." He said: "Then I wiped myself with the sand of the grave of Hussain. Then I fell asleep, and I noticed that I had nothing of it anymore." Source: Al-Tuyuriyat by Al-Tuyuri. Pg. # 467, Vol. 3. H # 838. 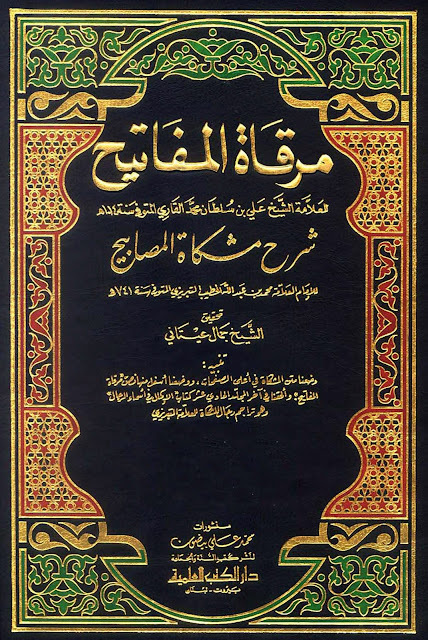 Al-Sheikh, Al-Imam, the role model, the scholar of Hadeeth (Muhaddith), Sheikh of Sufia, Aboo Muhammad Ja'far ibn Muhammad ibn Nosayr ibn Qasim Al-Baghdadi, he lived in the district of Al-Khold. Source: Siyar A'lam An-Nubala. Vol. 15, Pg. # 558. Person. # 333. ...he travelled a lot and heard a lot of hadeeths and narrated a lot of knowledge and many narrated from him like Alee ibn Umar Al-Darqutni, ibn Shaheen and many others and he was trustworthy honest and religious, he went 60 times for hajj and he died in the month of Ramadhan. 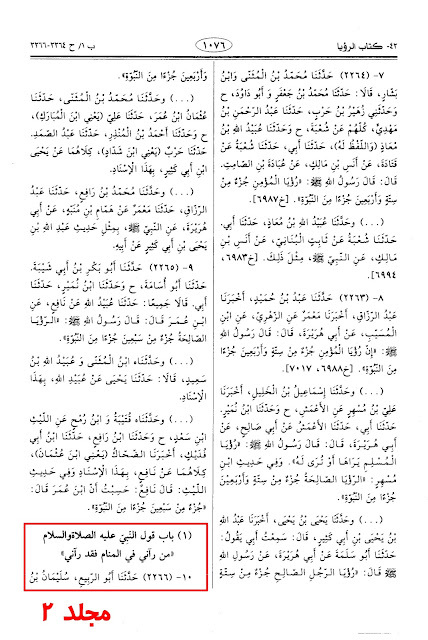 Source: Al-Muntazah. Vol. 14, Pg. # 119, Person # 2588. It is not binding upon the 'Ahl us Sunnah' to follow the fourth century Sufi saint, Aboo Muhammad Ja'far ibn Muhammad who claims to have been cured from the sand of the grave of Imam Hussain (a.s). 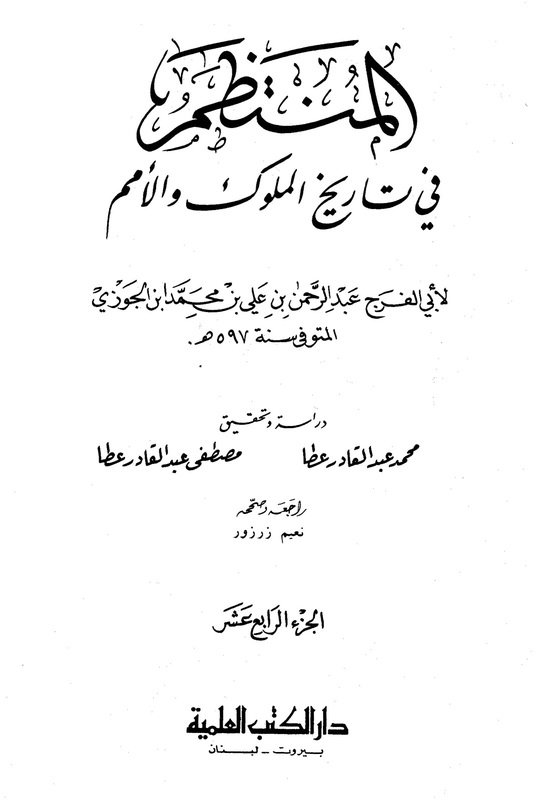 Individuals such as Ibn Taymiyyah (and others) did not condemn all Sufis, he explained the practices and customs of Sufism in multiple Fatwas. He gathered all these Fatwas in one volume entitled Kitaab At-Tasawwuf. 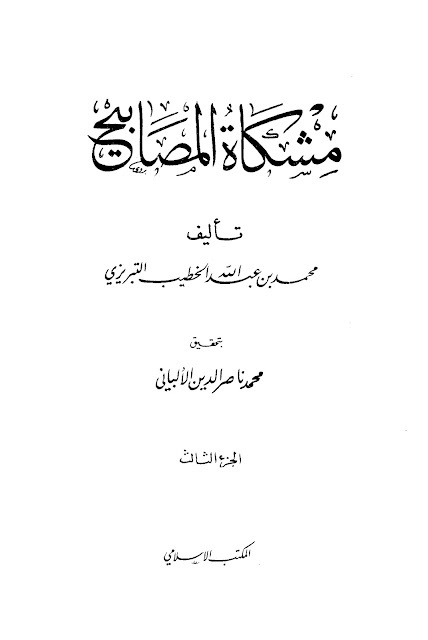 He praised some Sufis while regarded others as innovators. 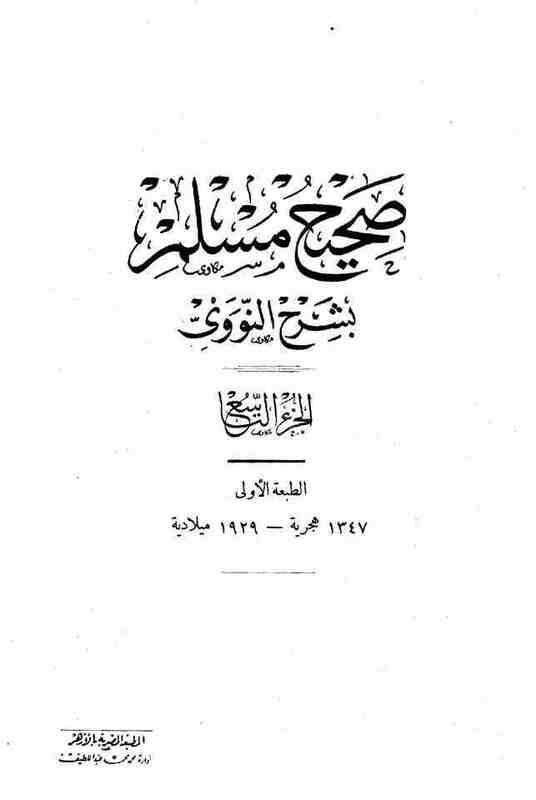 He believed that the allies of Allah (swt) are pious Muslims, whether they are the poor, Sufis, scholars of Fiqh (Islamic jurisprudence), scholars, traders, workers, emirs or governors. Aboo Muhammad Ja'far ibn Muhammad has been praised by the scholars of Rijal and Al-Dhahabi regarded him as a role model. Is it evident from the above cited narrations that our beloved Prophet (saw) himself mourned for his beloved grandson Imam Hussain (a.s) even prior to the tragic event taking place. He (saw) was disheveled, covered in dust and was wailing for him (a.s). We even find the Jinn mourning for the same reason. He (saw) and his wives (peace be upon the righteous ones) also held great regard for the red soil of Karbala since it was not some ordinary soil, but soil in which retained a cure for every illness and hence for people to gain great benefit. 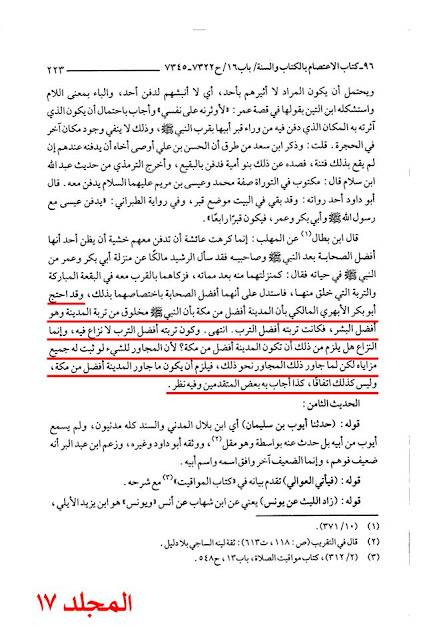 So why is it that we find the present day Nawasib in dispute with those who act in accordance with the Prophet (saw)? The Shi'ee are but only following the Sunnah of the Prophet (saw) and are effective in doing so, whilst the Nawasib themselves, on the contrary do not, and at the same time ironically claim themselves to be the true followers. The Shi'ee have in fact a deep and passionate love for Imam Hussain (a.s) and based on such utter love, rituals in various forms are performed. It is unfortunate that the majority fail to understand that love is something immeasurable and not rigid in nature to which a limit is unheard of except for those with stone-like hearts. The Shi'ee remain adamant upon this love, and no matter how much the Nawasib attempt to humiliate and degrade the Shi'ee with their propaganda, their love will continue and will never diminish. Mashallah, a very good collection!